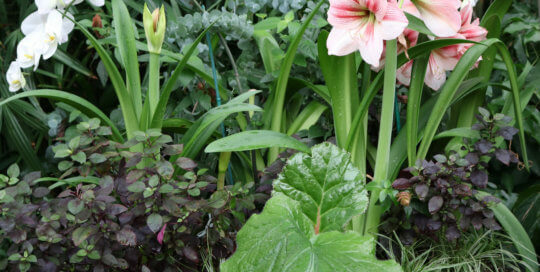 See our Garden change, evolve and mature month by month, season by season, year by year. 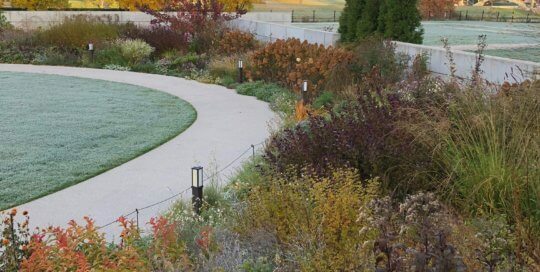 Click each month for a gallery of images that capture the Garden’s best and most interesting during that time. 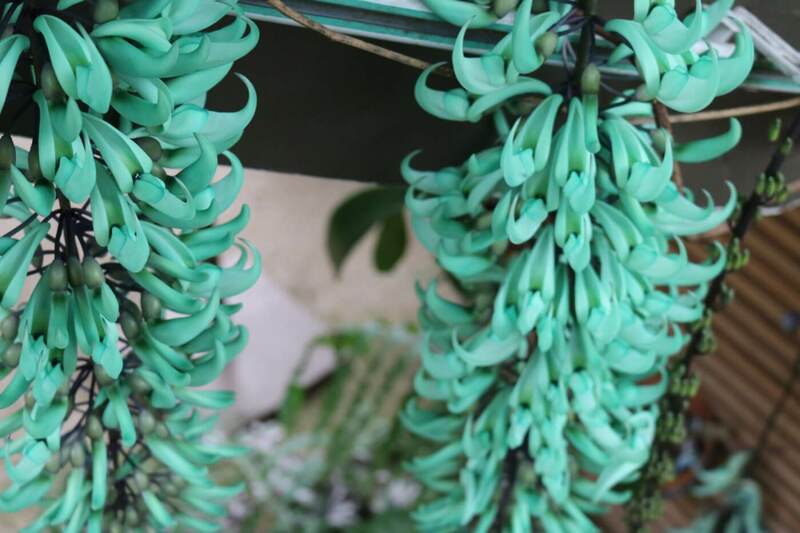 Our rare jade vine had plenty of inflorescences this month, demanding attention with its gorgeous turquoise hue. 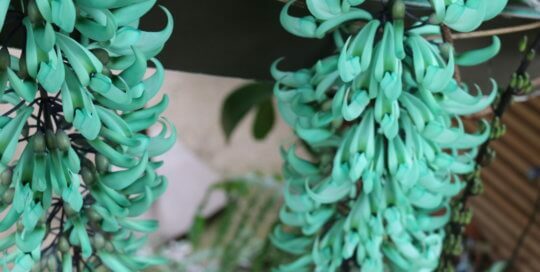 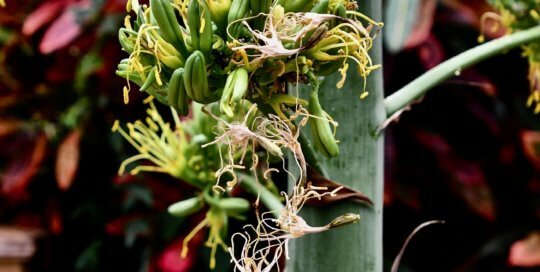 A closer look at the unique Strongylodon macrobotrys (jade vine) flowers. 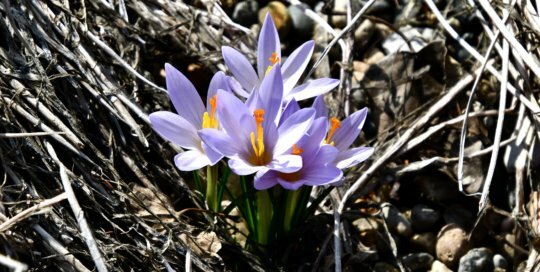 These beautiful lilac-colored crocus flowers signaled spring's welcome beginning this month. 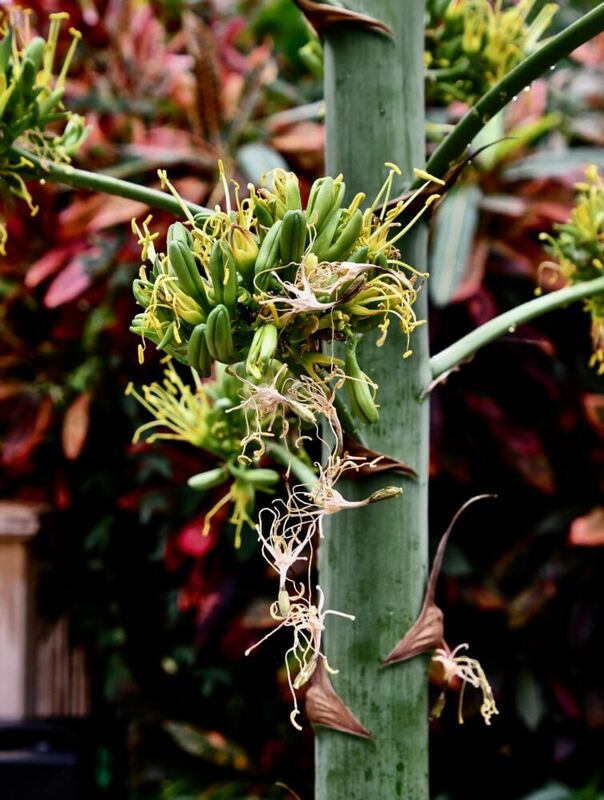 Agave desmettiana inflorescence in the conservatory. 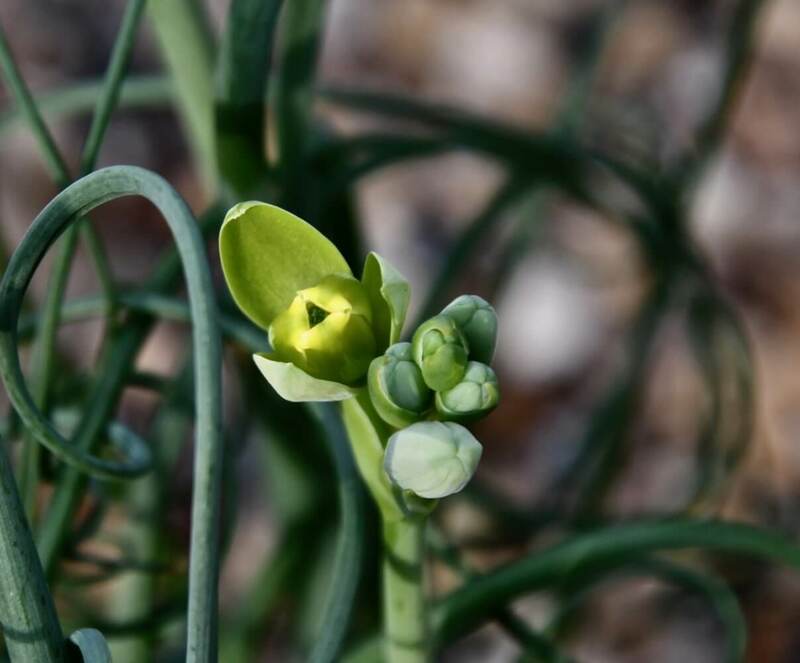 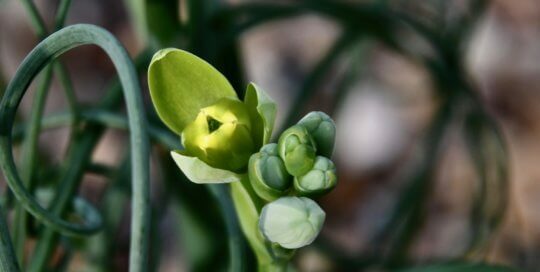 An Albuca spiralis flower in an early stage of bloom. 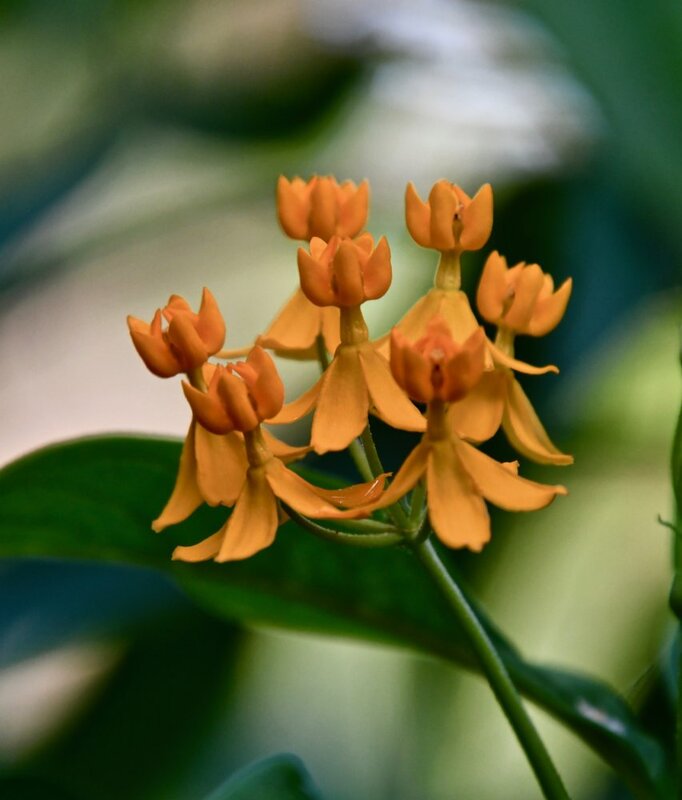 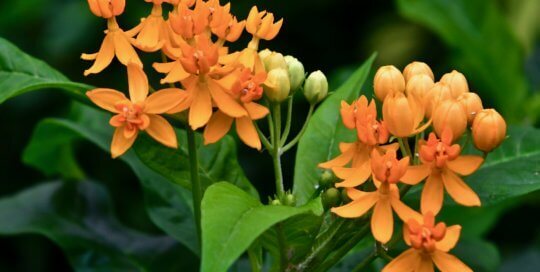 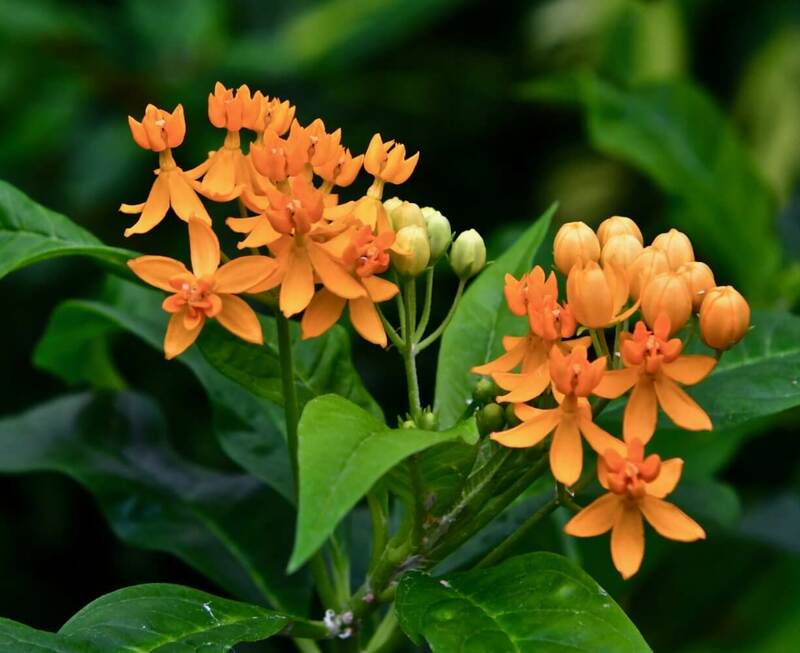 These bright orange Asclepias curassavica flowers are small but striking in the conservatory. 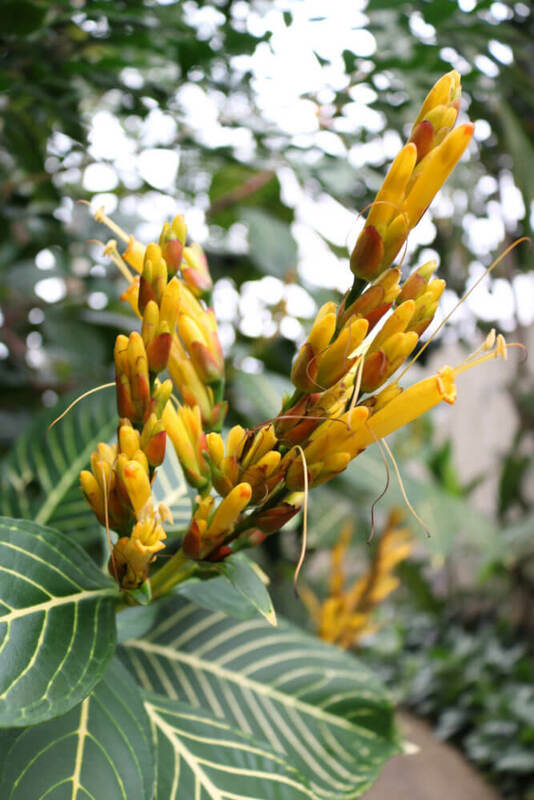 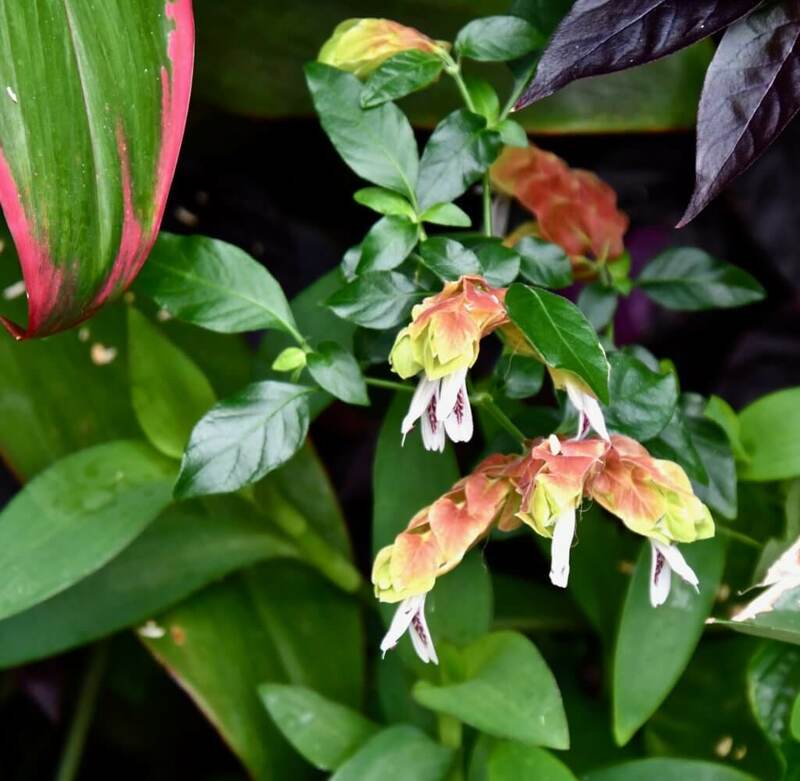 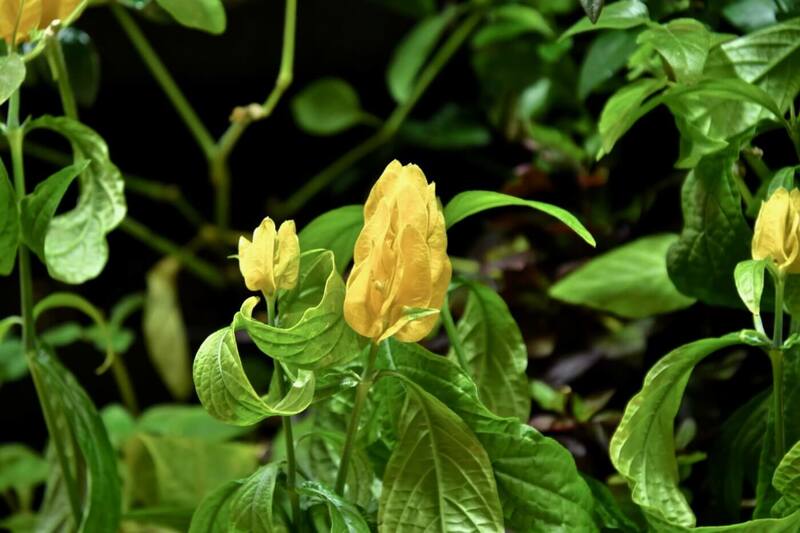 This Pachystachys lutea (golden shrimp plant) flowered beautifully this month in the conservatory. 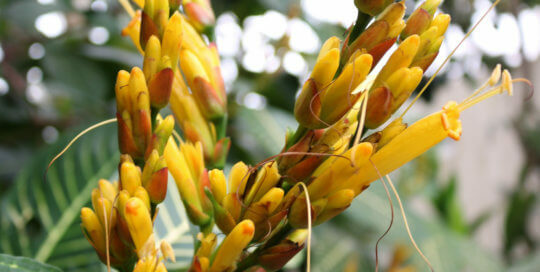 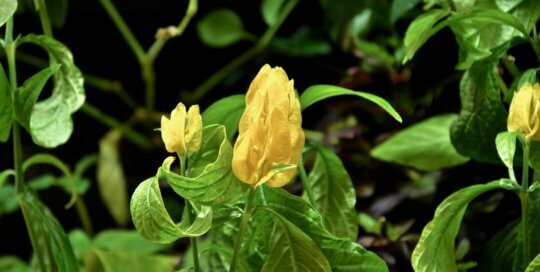 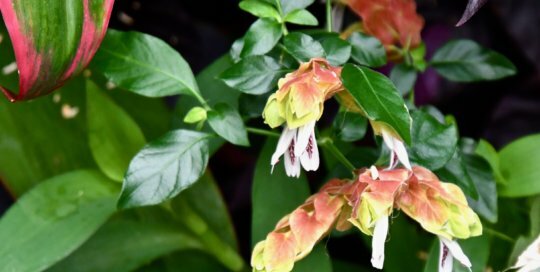 Another stage of Justicia brandegeeana flowers in bloom. 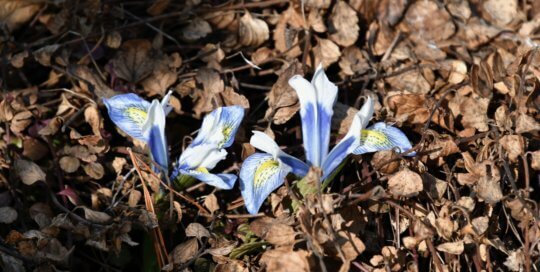 These blue irises brought the first signs of spring to the Garden. 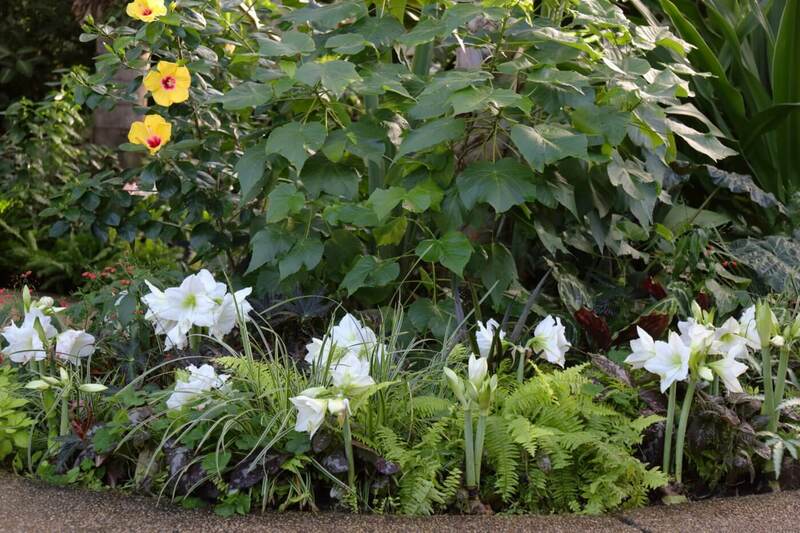 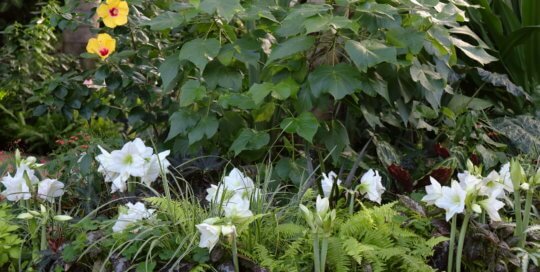 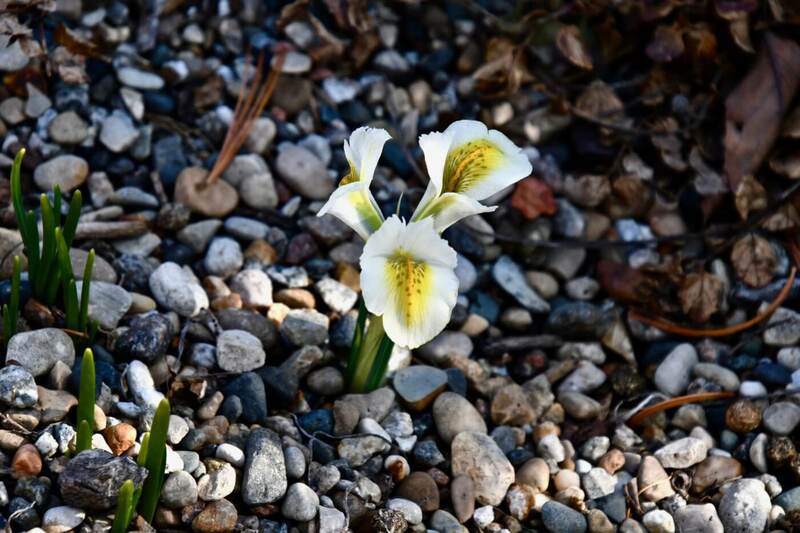 These white iris flowers added cheerful pops of yellow to the Dorothy and Max Rutledge Conifer Garden in early spring. 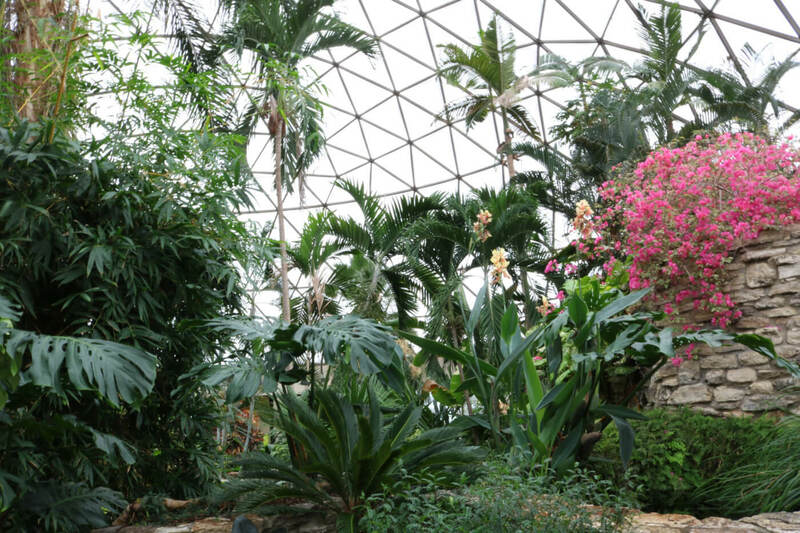 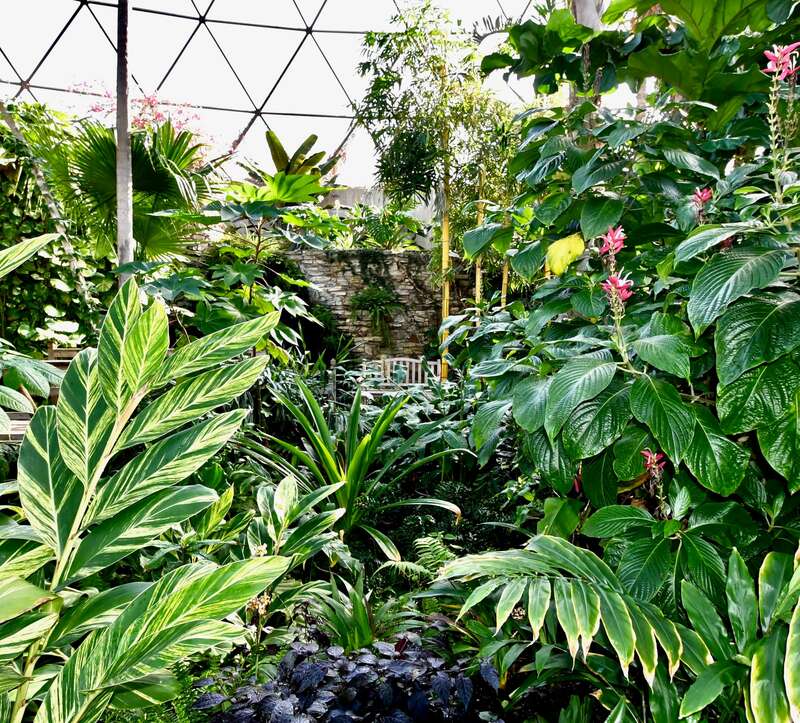 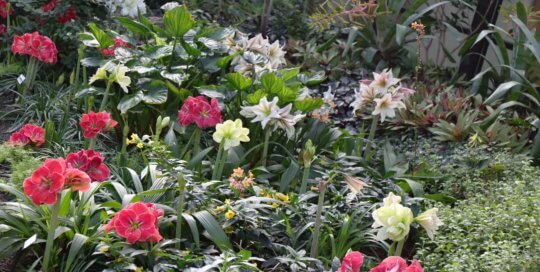 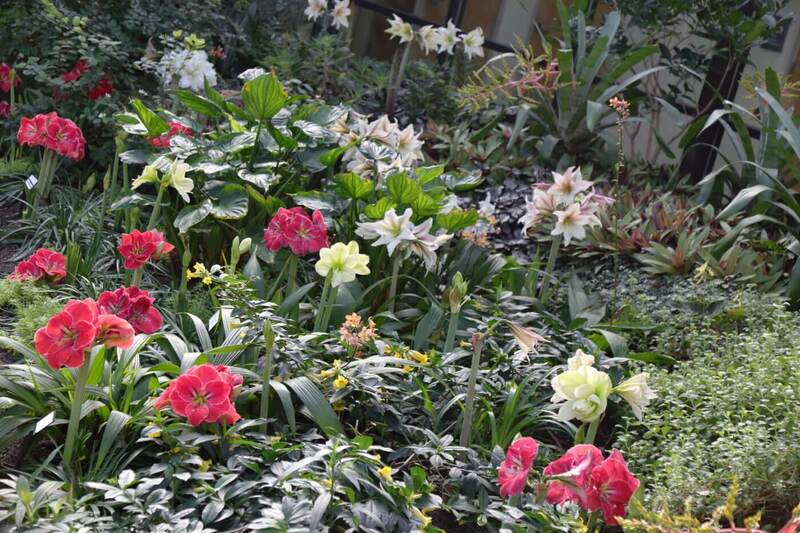 The conservatory landscape looked especially striking with numerous shades of green and accents of pink this month. 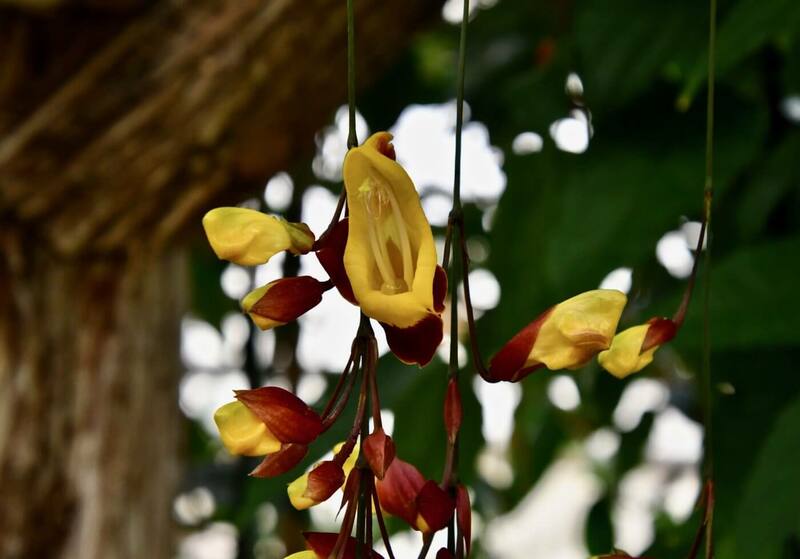 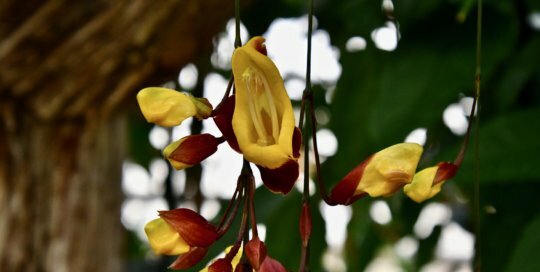 Native to southern India, this Thunbergia mysorensis (Indian clock vine) is blooming now in our Gardeners Show House. 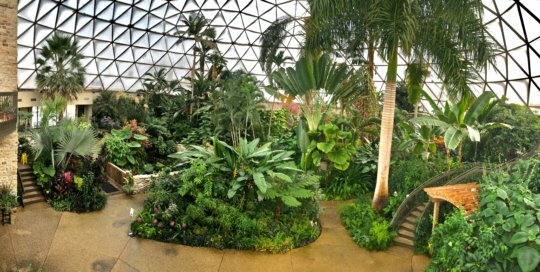 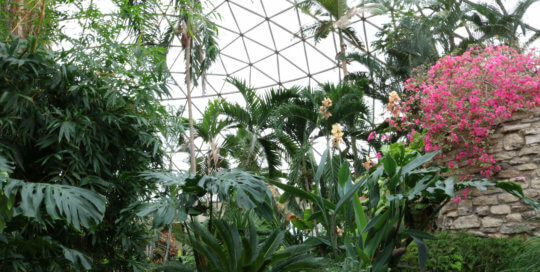 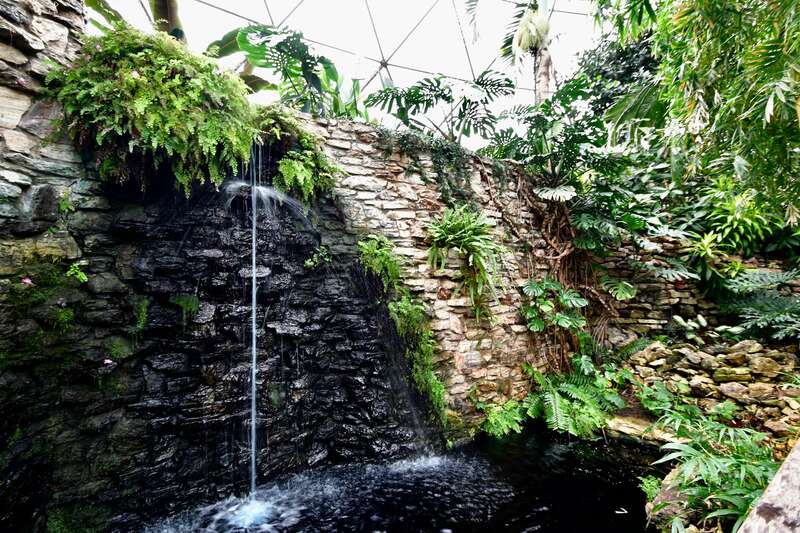 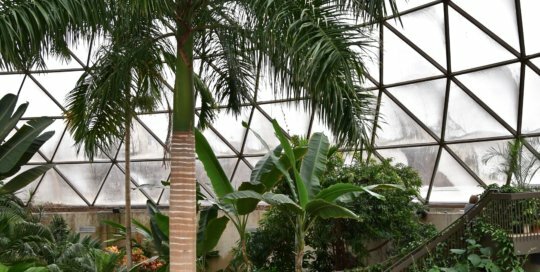 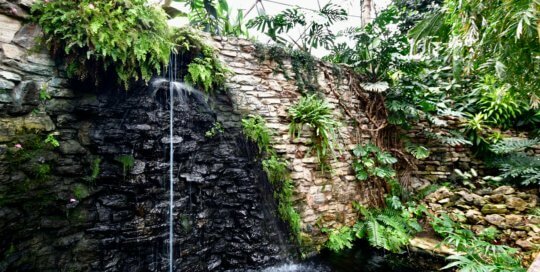 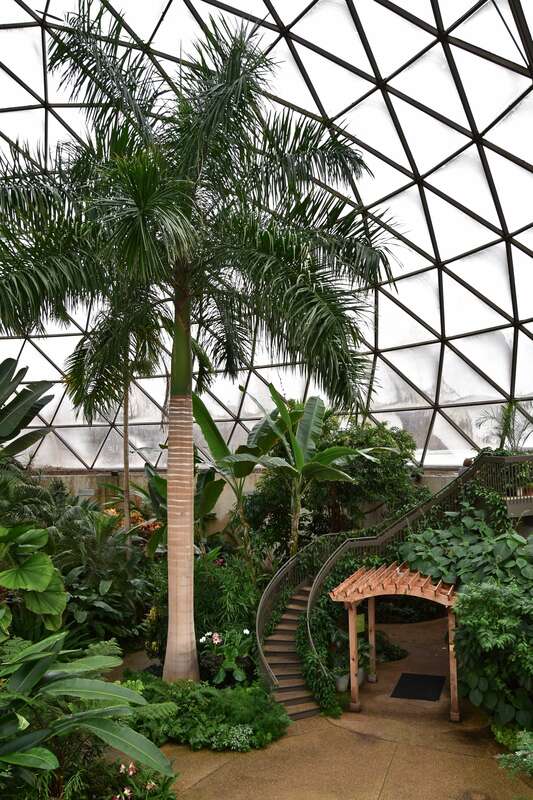 The conservatory greenery provided a tranquil view from the waterfall bridge. 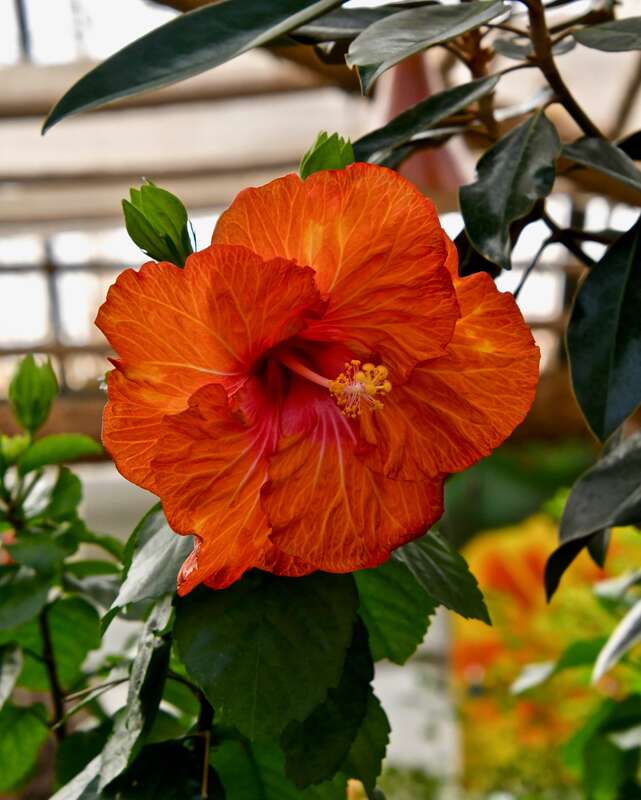 Bright orange and pink hibiscus flowers brought vibrant color to the Gardeners Show House in March. 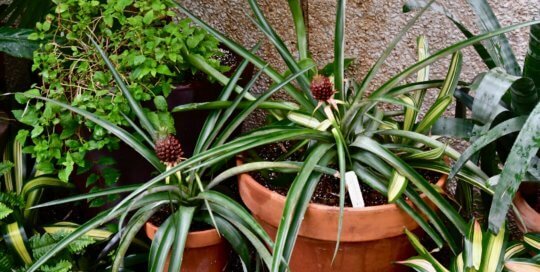 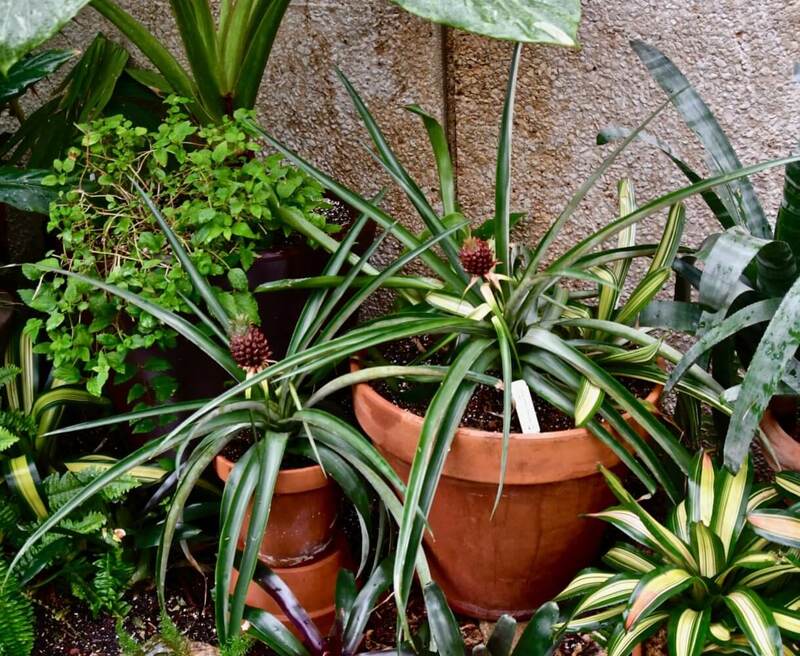 Along the edge of the conservatory, these small pineapples can be found growing from terra cotta containers. 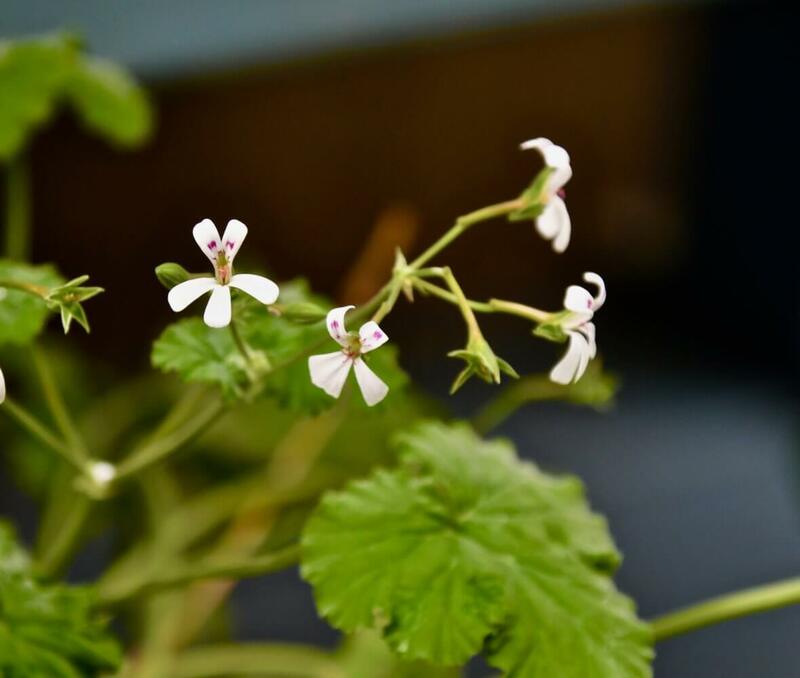 These delicate white and pink flowers bloomed from a scented geranium plant in the Gardeners Show House. 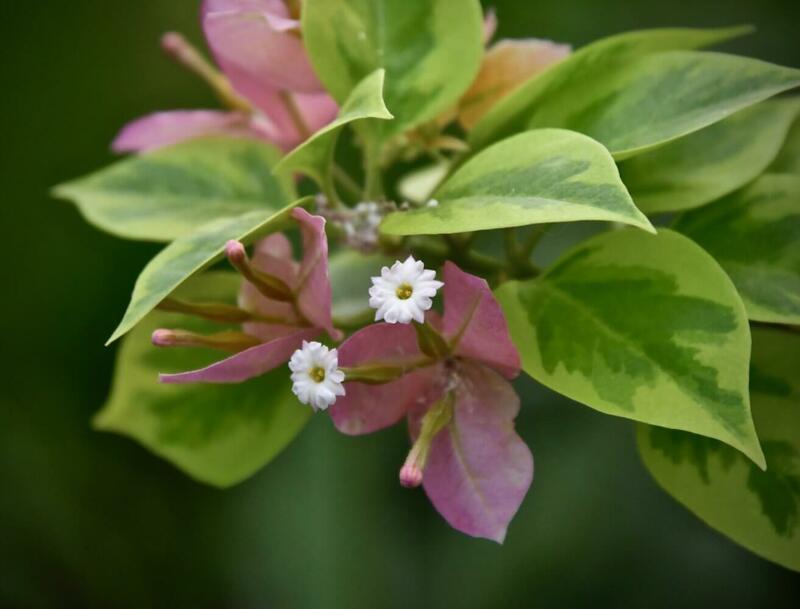 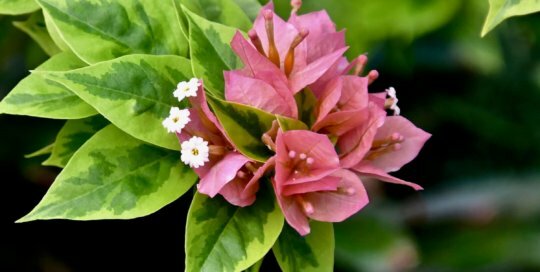 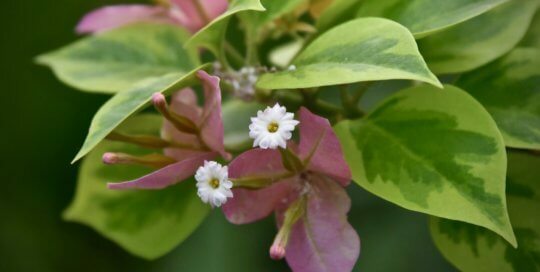 This variegated bougainvillea plant attracts attention with intricate leaf detail in the conservatory. 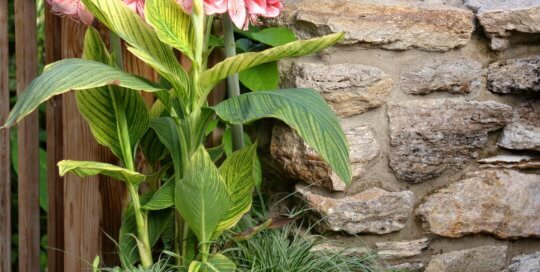 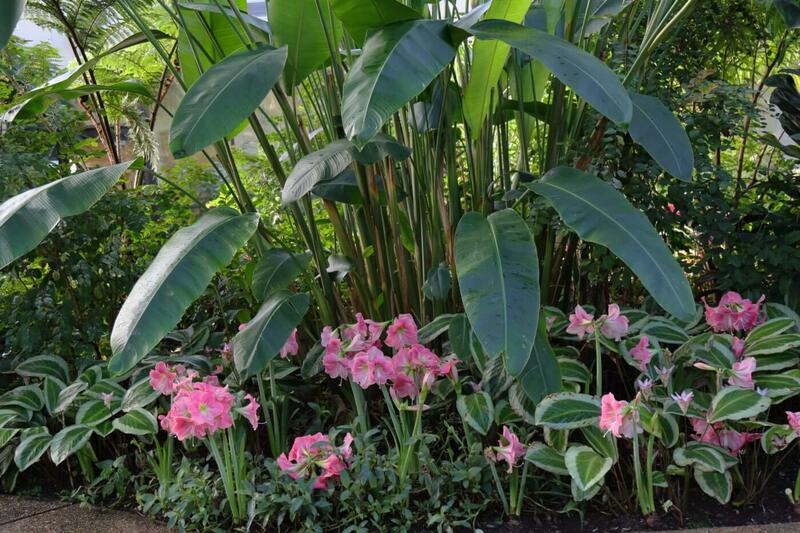 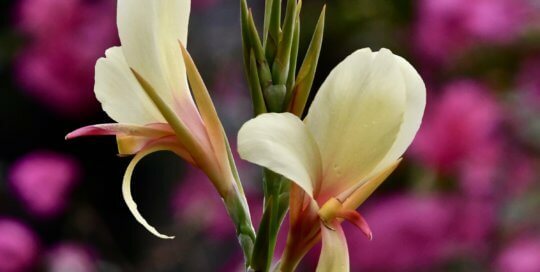 These blooming canna flowers added classic pastel shades to the bright conservatory landscape. 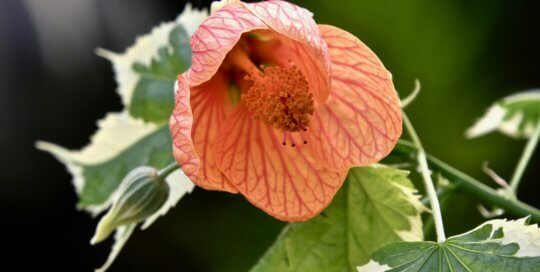 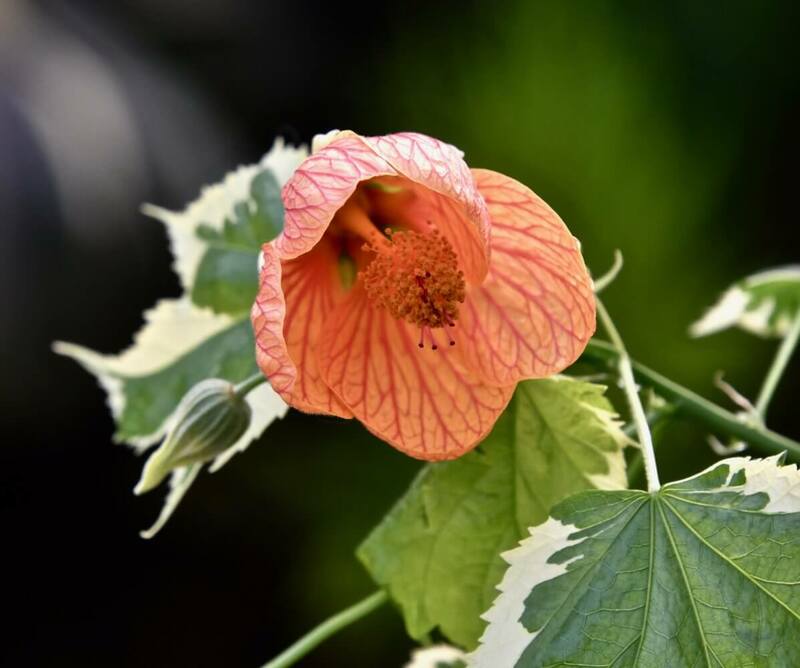 This colorful Abutilon ‘Souvenir de Bonn’ unfolds beautifully in the sunlight. 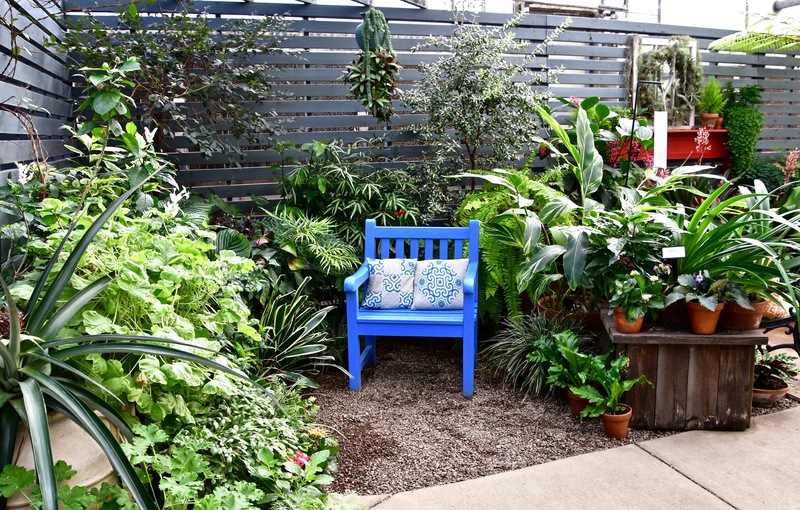 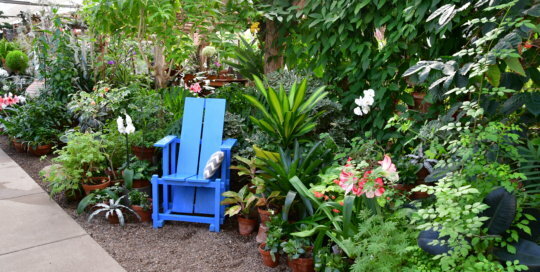 Take a seat in this cozy corner of the Gardeners Show House for a relaxing break. 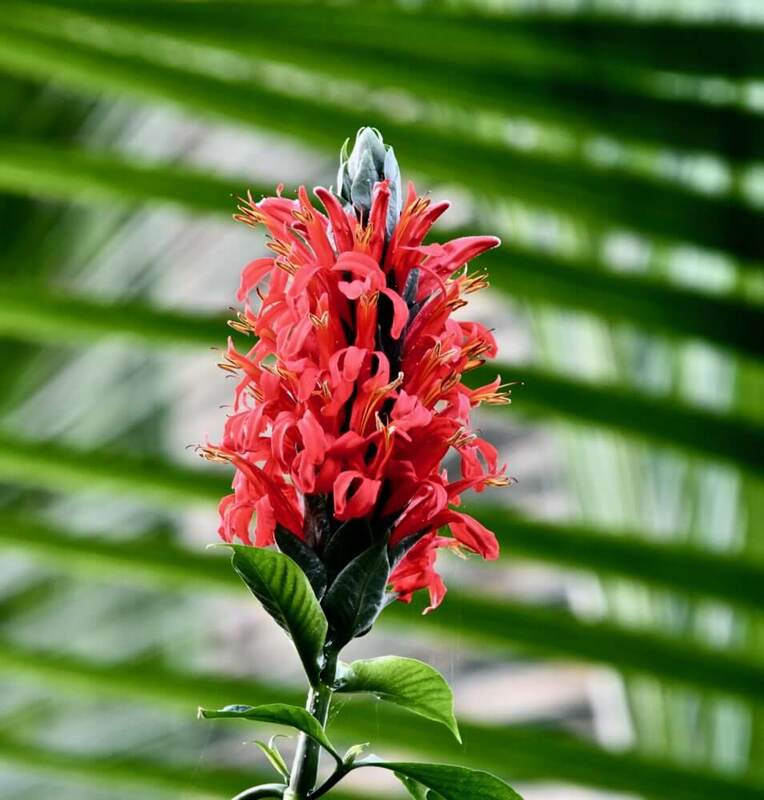 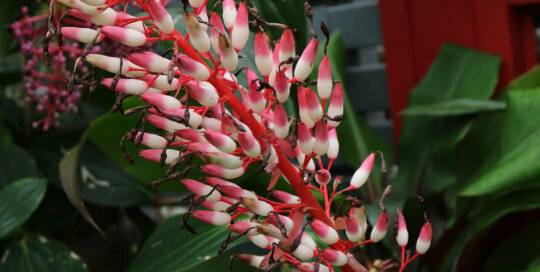 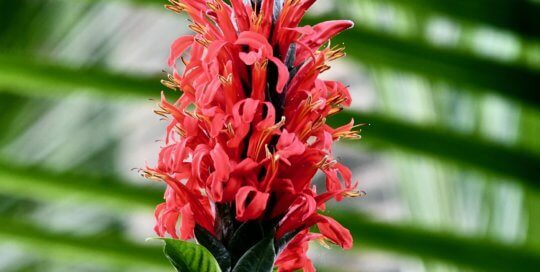 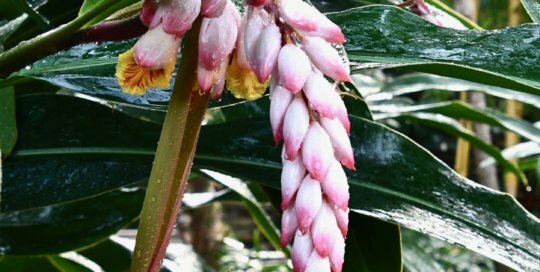 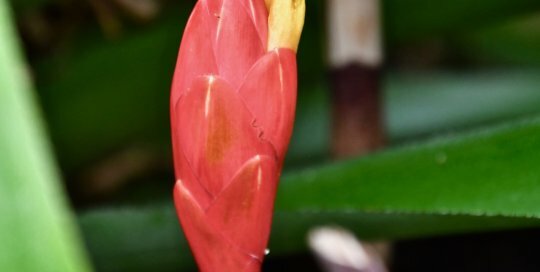 Alpinia formosana flowers vibrantly among the lush conservatory greens. 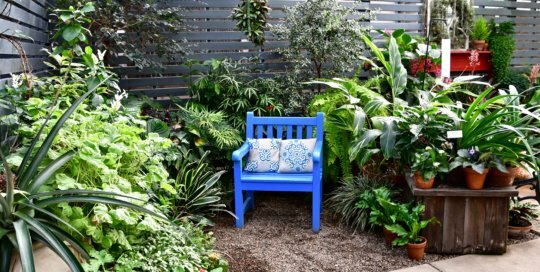 Gardening inspiration extends high and low in the Gardeners Show House. 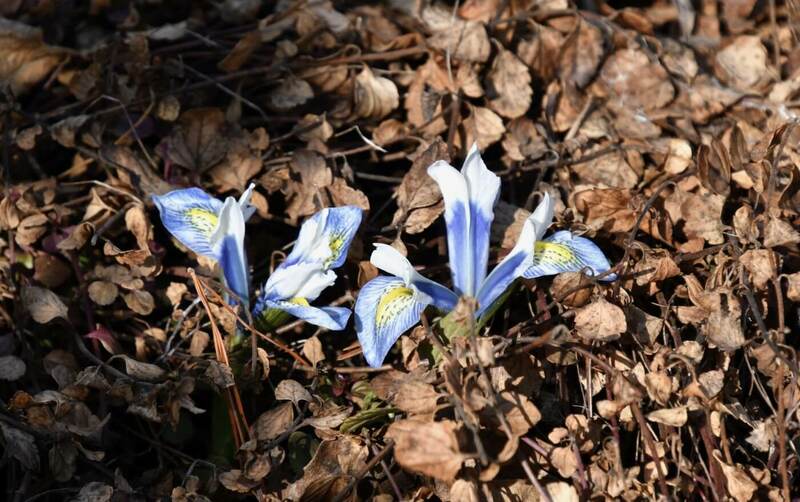 Artful patterns and splashes of indigo bring this Neomarica iris to life. 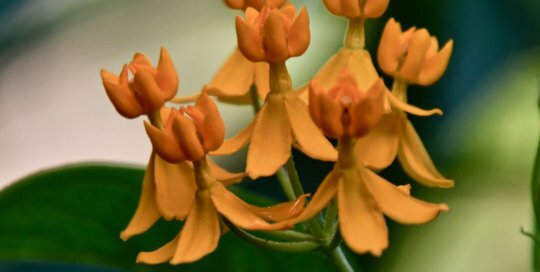 Asclepias curassavica ‘Silky Gold’ shows off its warm color in the conservatory. 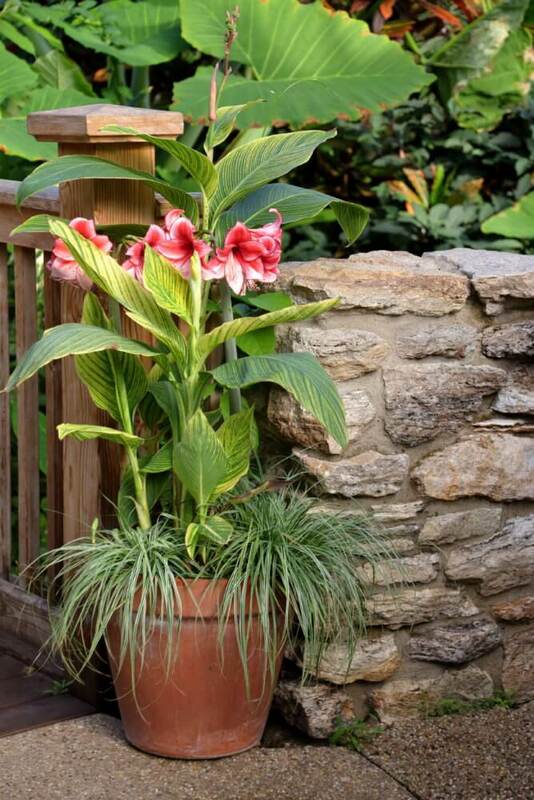 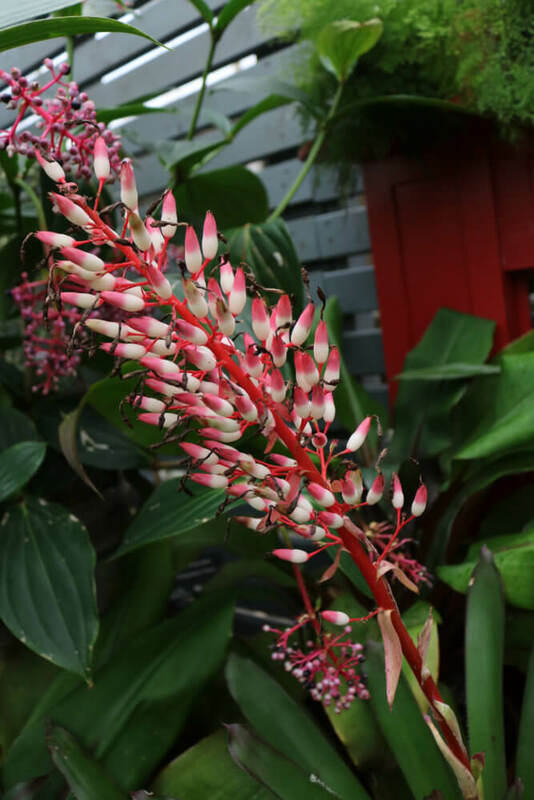 Cardinals guard blooms in a spike formation, adding even more interest to its vibrant flowers. 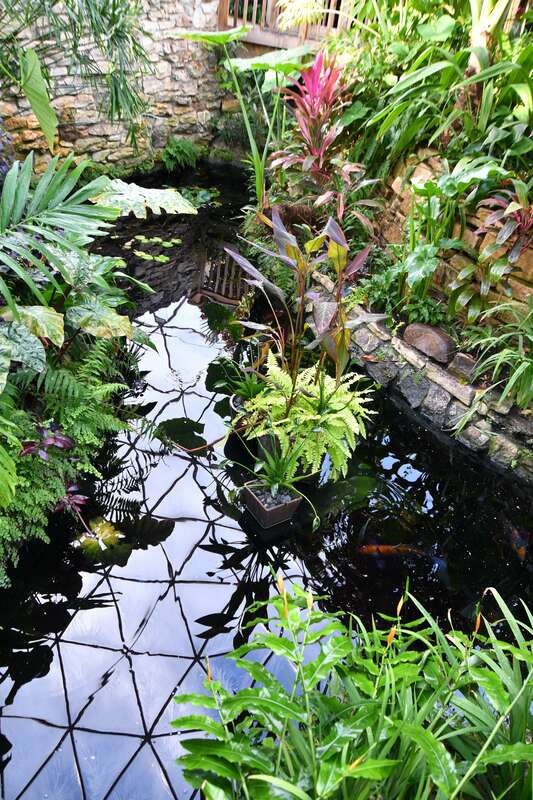 Even in winter, the conservatory pond comes alive with aquatic plants and fish. 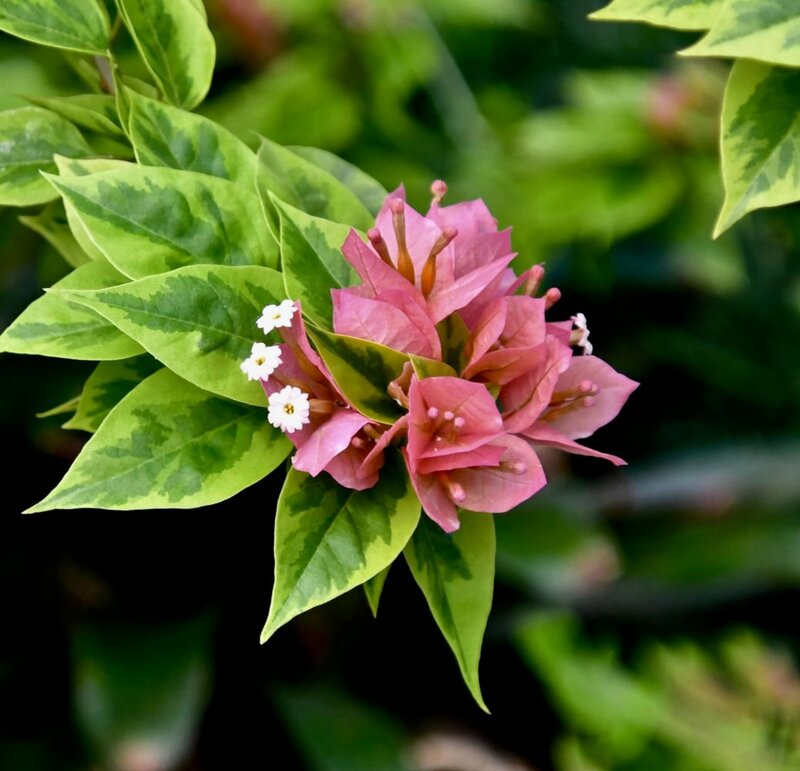 Bougainvillea ‘Raspberry Ice’ grows dainty white blooms and leaves that appear painted. 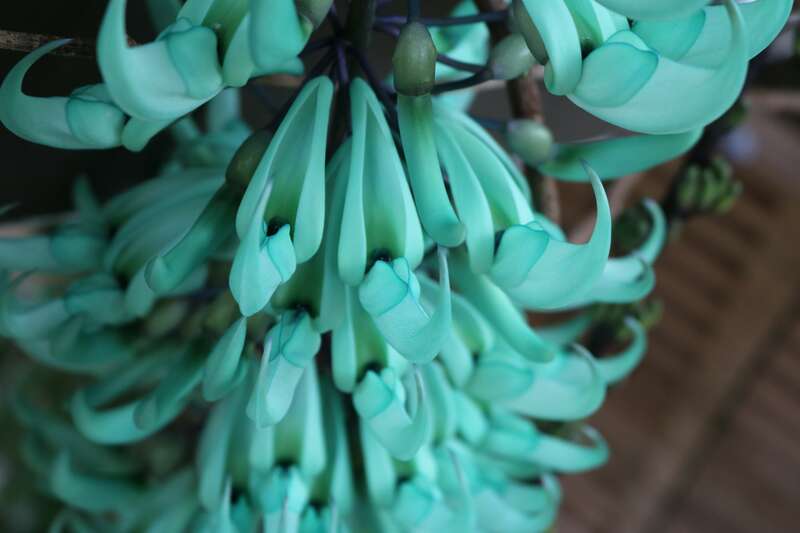 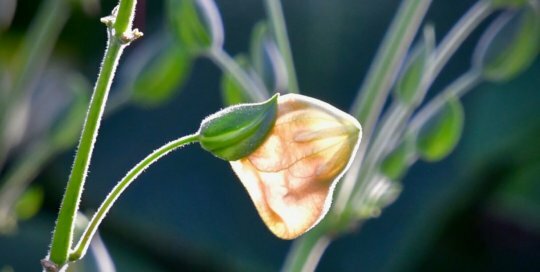 Sunlight filters beautifully through this blooming Louteridium flower. 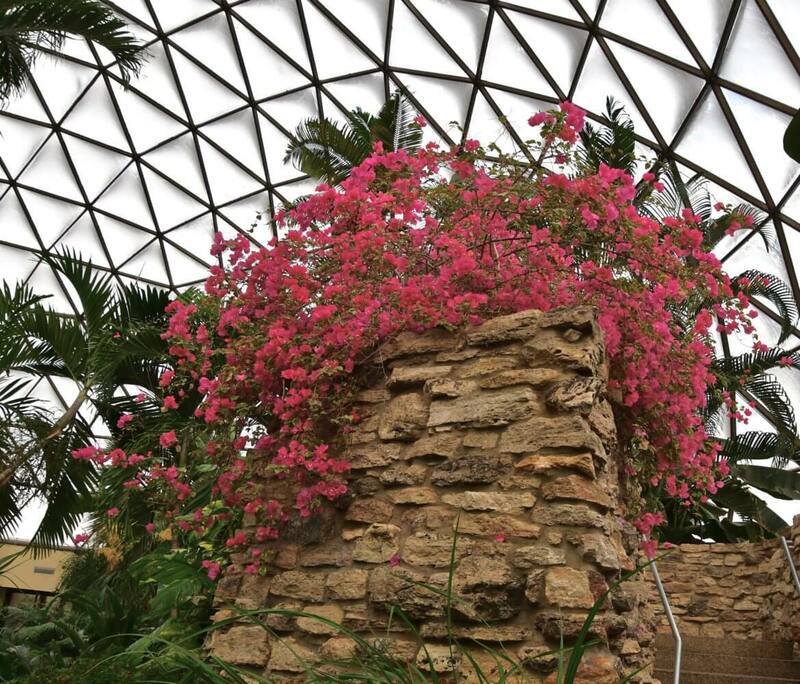 Climb to the top of the waterfall to see Bougainvillea ‘Raspberry Ice’ up close. 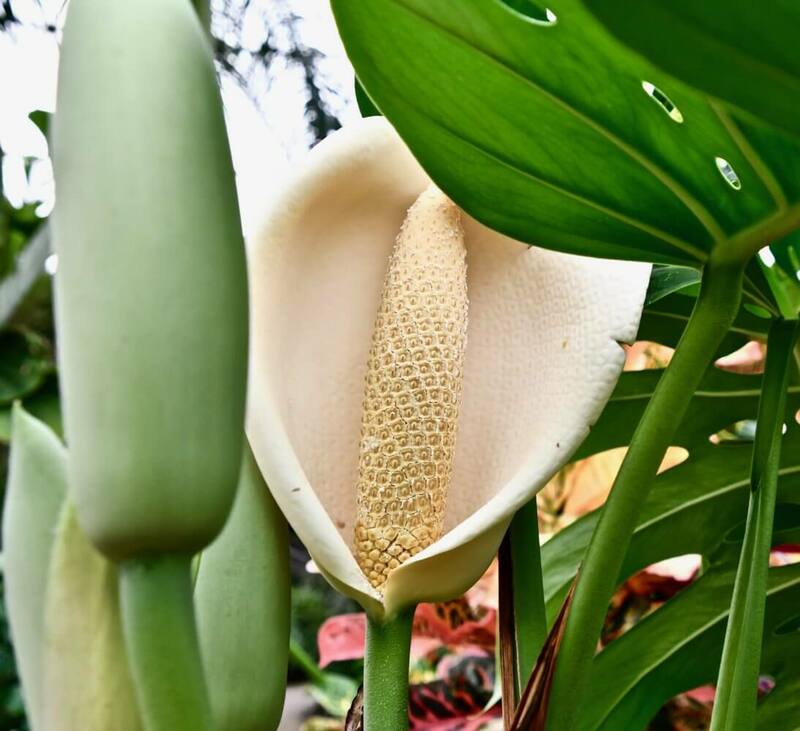 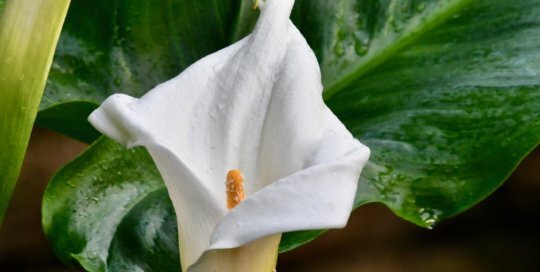 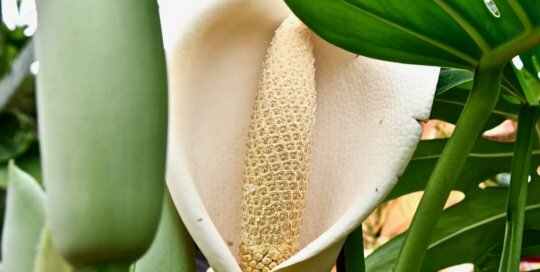 The calla lily enchants conservatory visitors with its classic beauty. 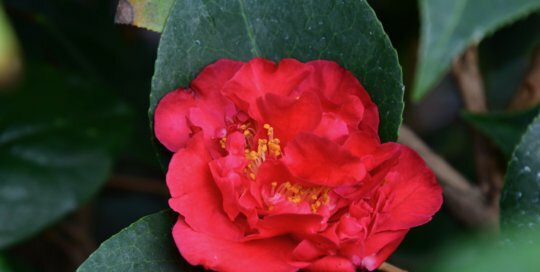 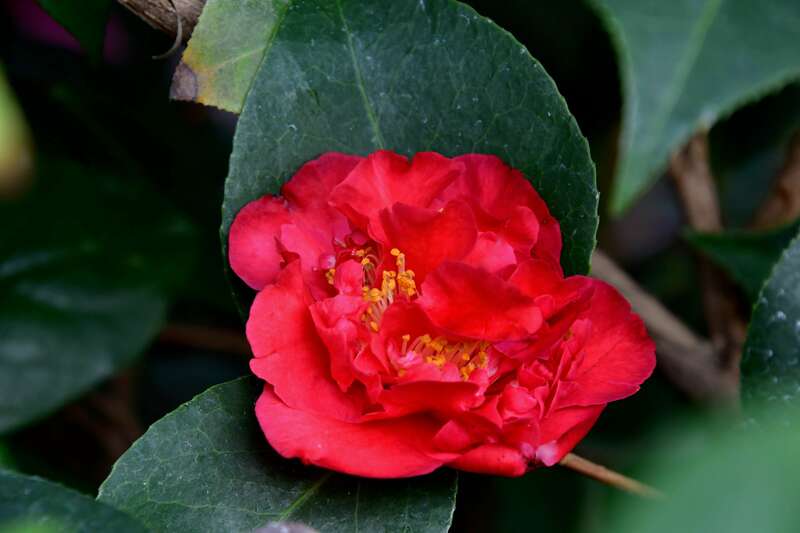 This camellia flower adds layers of red to this bed of green. 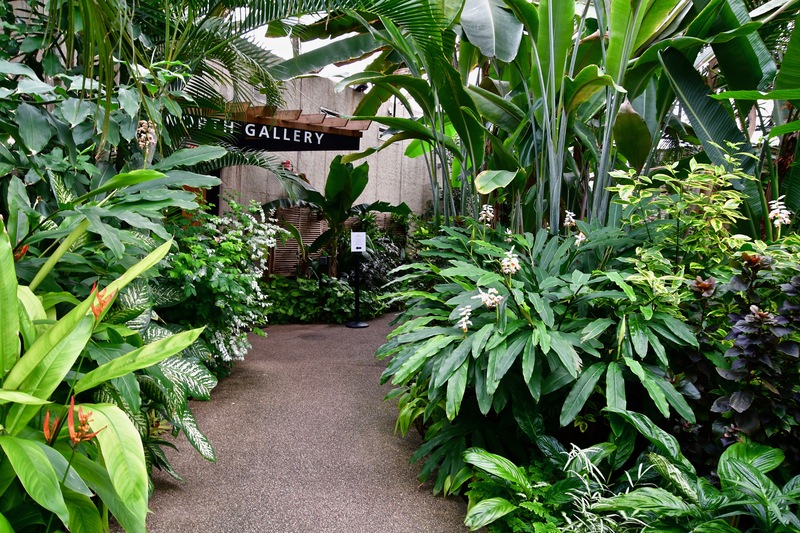 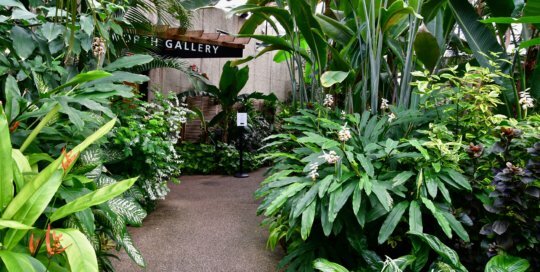 Take a walk through the tropical fronds to the North Gallery and find nature photography on display. 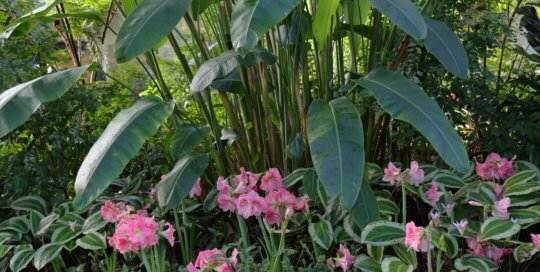 Costus stenophyllus (bamboo ginger) gracefully rises from the conservatory soil. 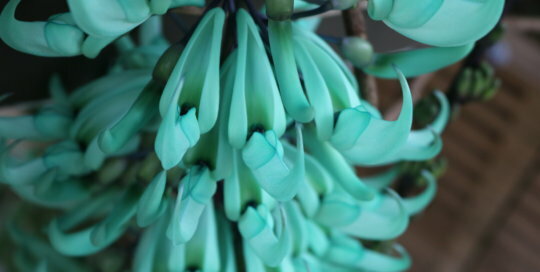 Jade vine colors the balcony stairway outside the garden commons. 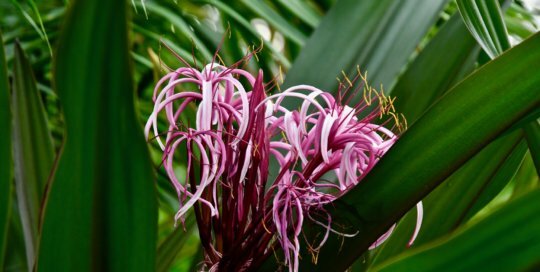 This giant crinum lily elegantly unfolds with shades of pink and magenta in the conservatory. 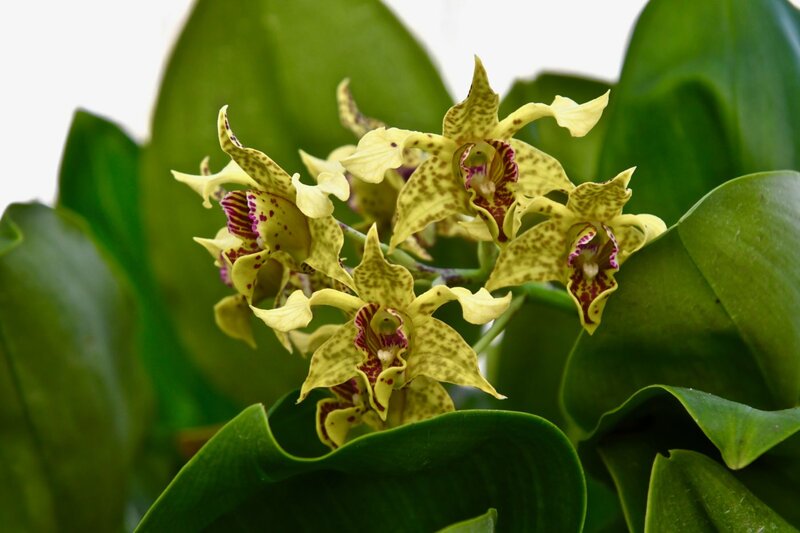 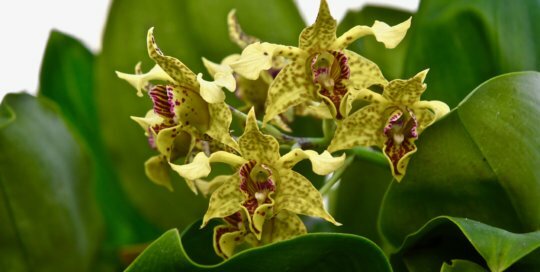 These Dendrobium atroviolaceum orchids stun with their colorful, spotted appearance. 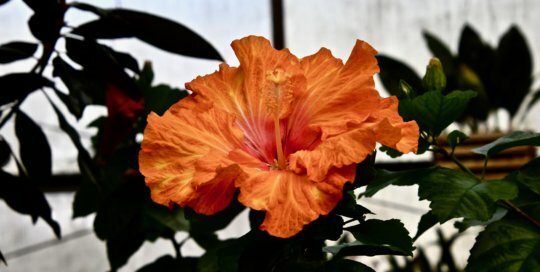 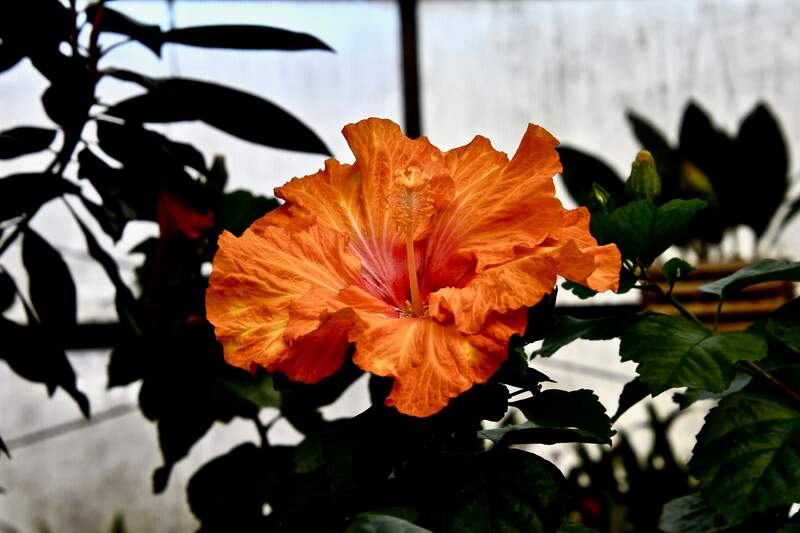 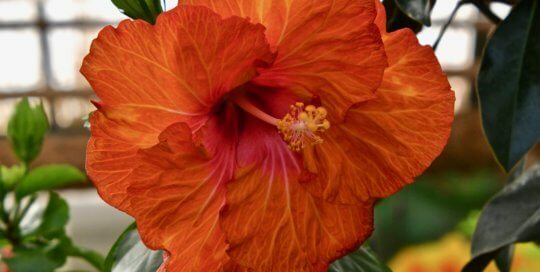 This bright orange hibiscus catches visitors' attention in the Gardeners Show House. 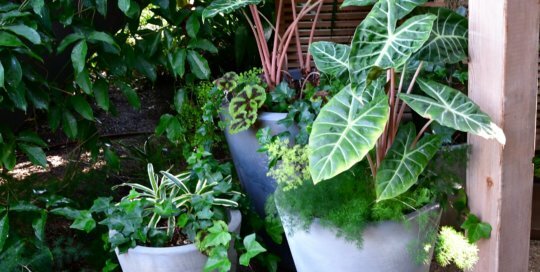 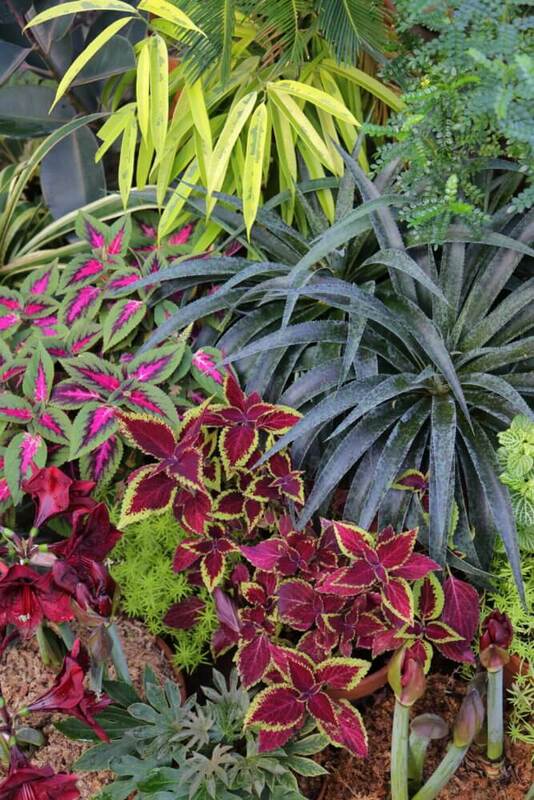 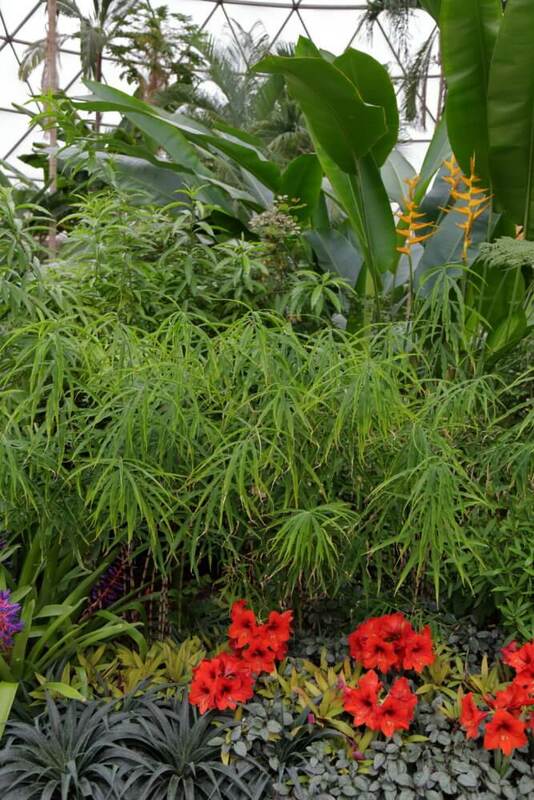 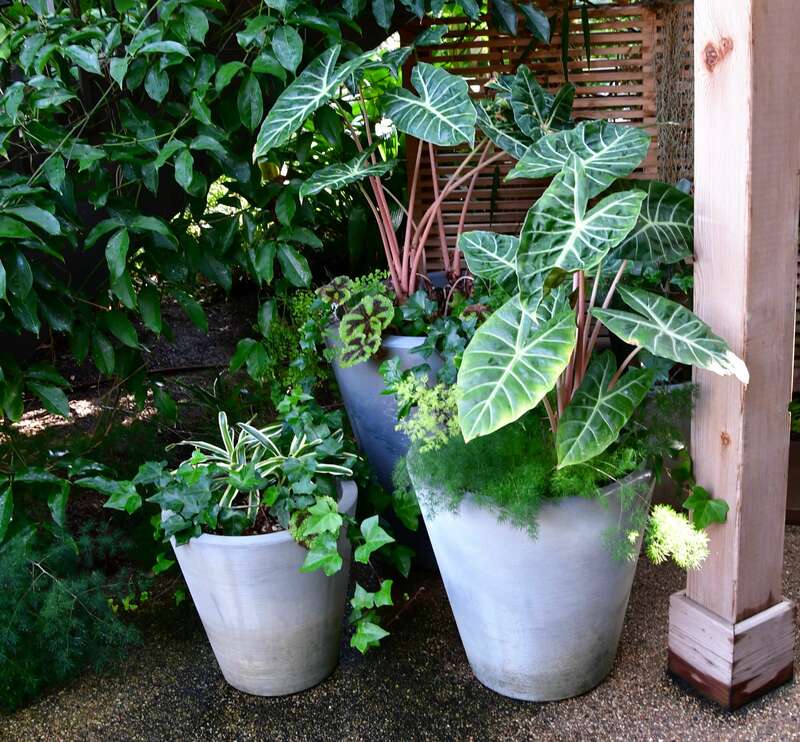 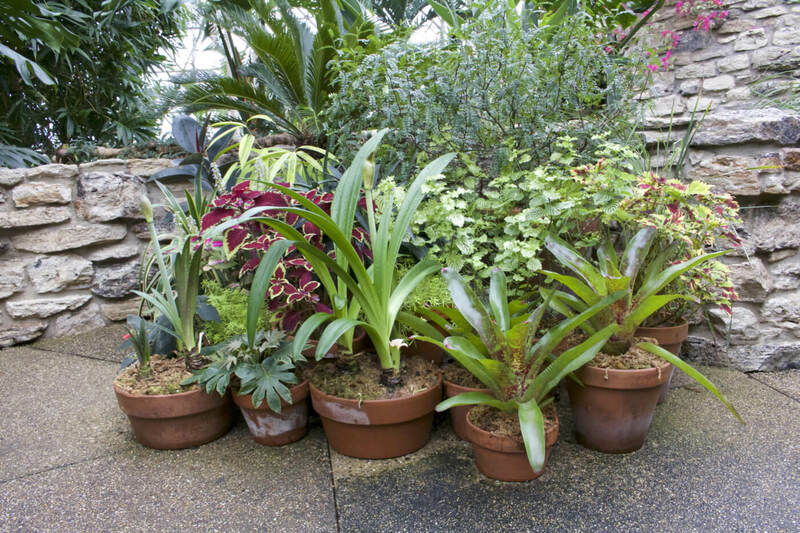 These leafy container plants thrive on display at the conservatory entrance. 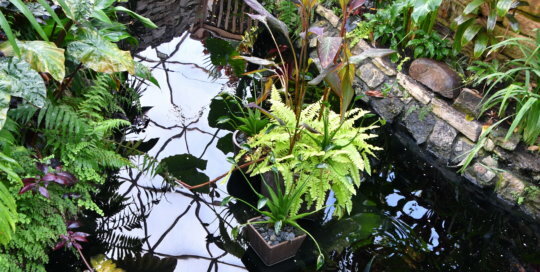 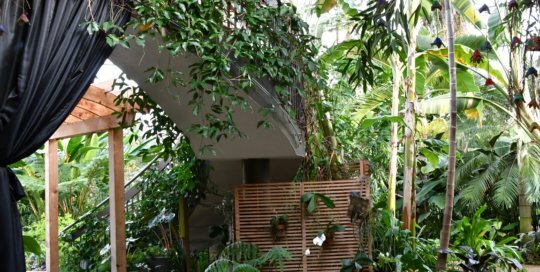 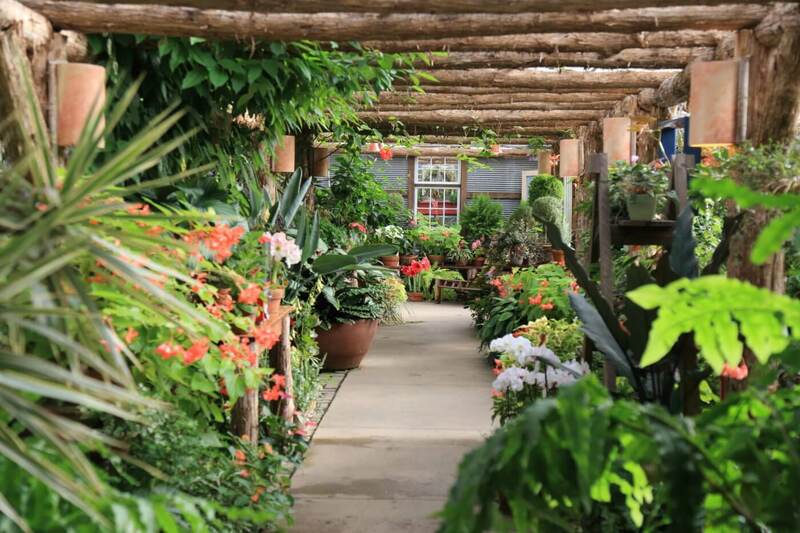 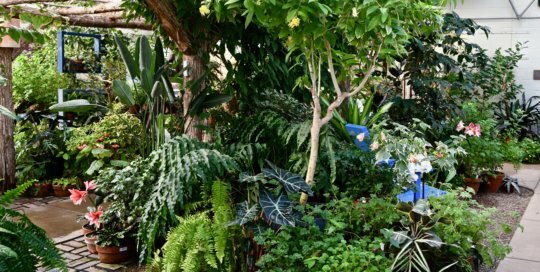 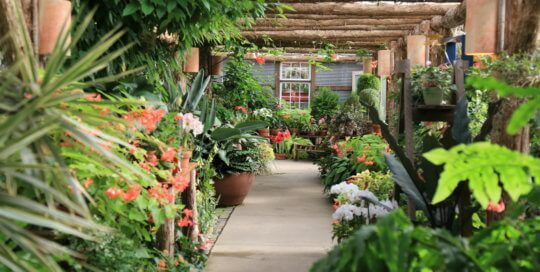 Relax in the Gardeners Show House surrounded by orchids, amaryliis and leafy greens. 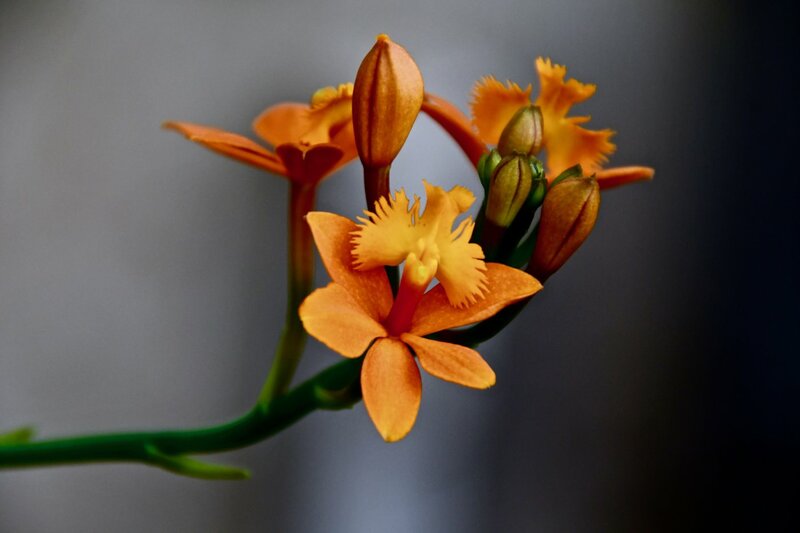 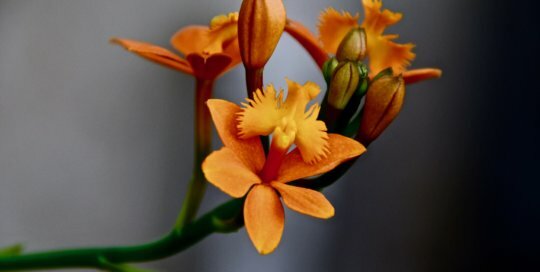 A detailed look at an Epidendrum 'Neon Valley' mid-bloom. 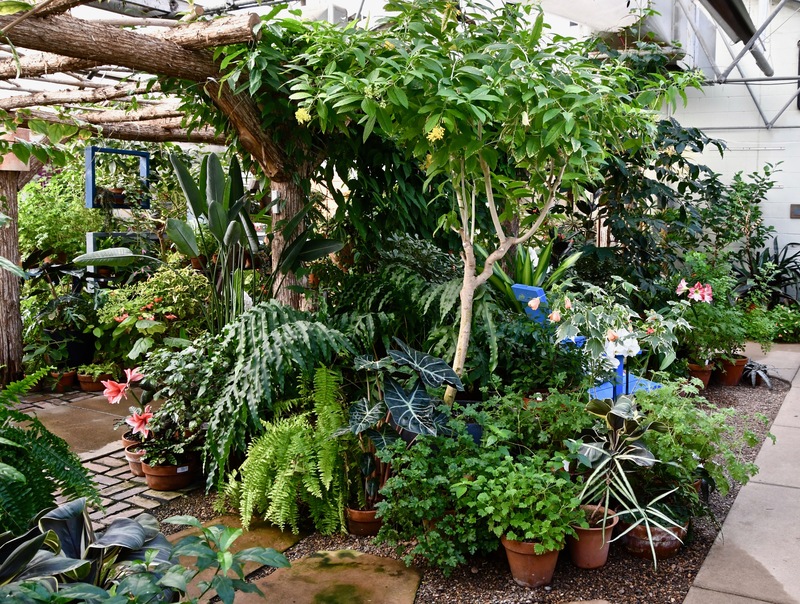 A predominantly green conservatory landscape, with pops of orange, pink and purple. 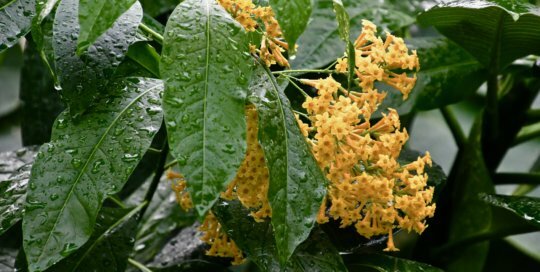 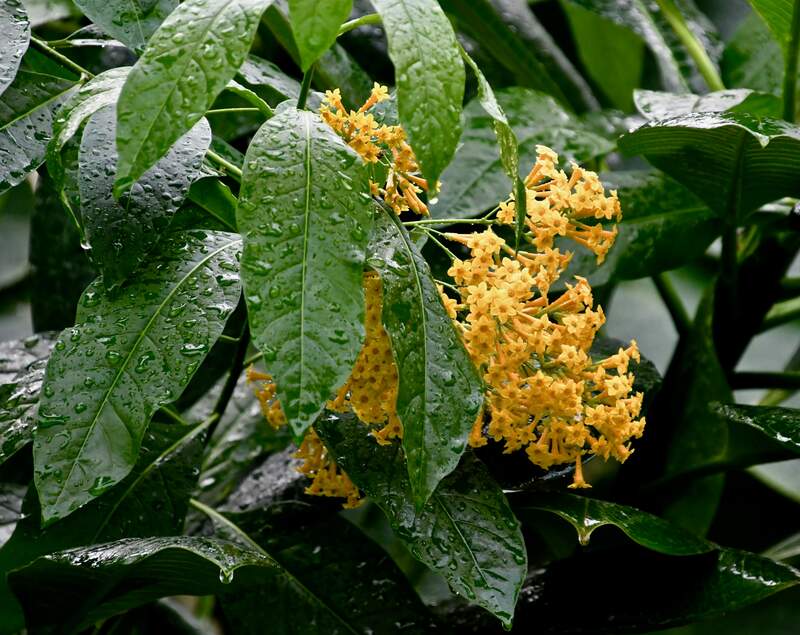 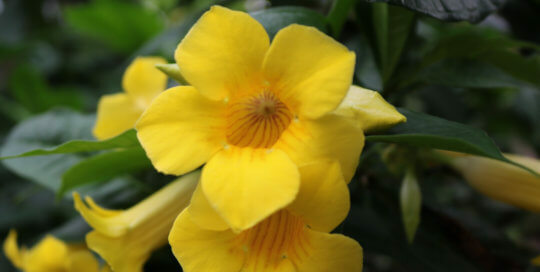 Bright yellow jessamine flowers pop against deep green conservatory leaves. 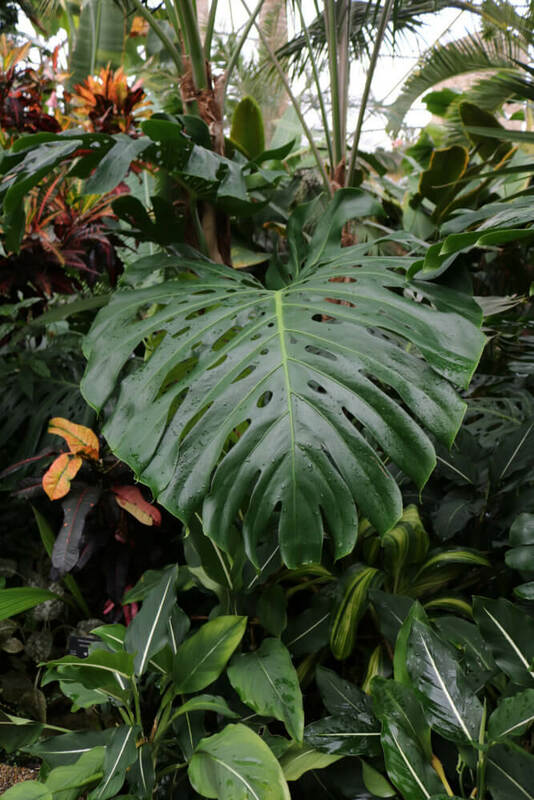 Monstera deliciosa (Swiss cheese plant) flowers with this mesmerizing, patterned bloom. 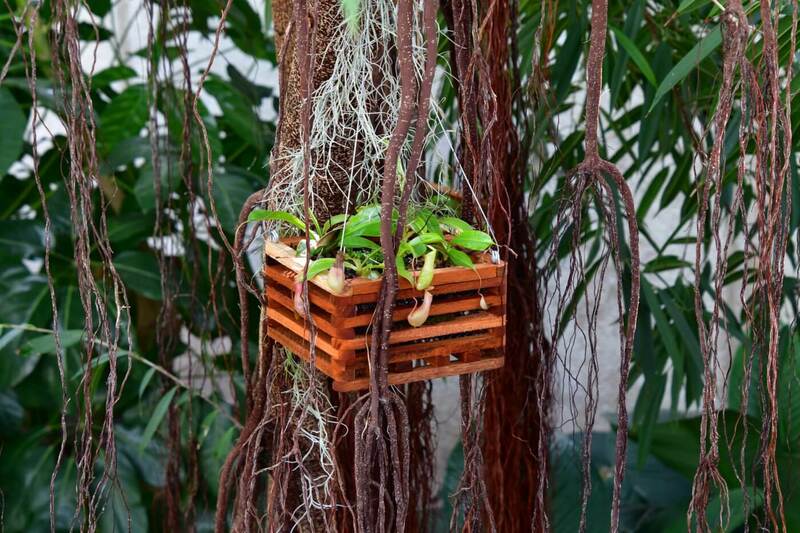 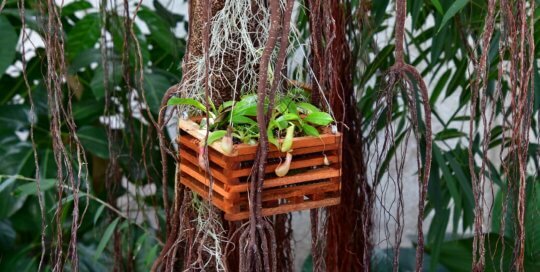 Nepenthes pitcher plants in a hanging tree basket. 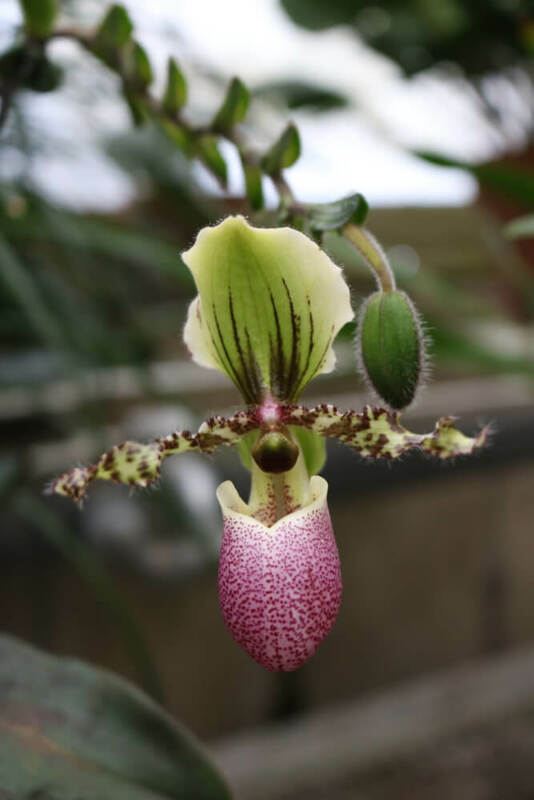 Paphiopedilum Bulldog in full bloom inside the Gardeners Show House. 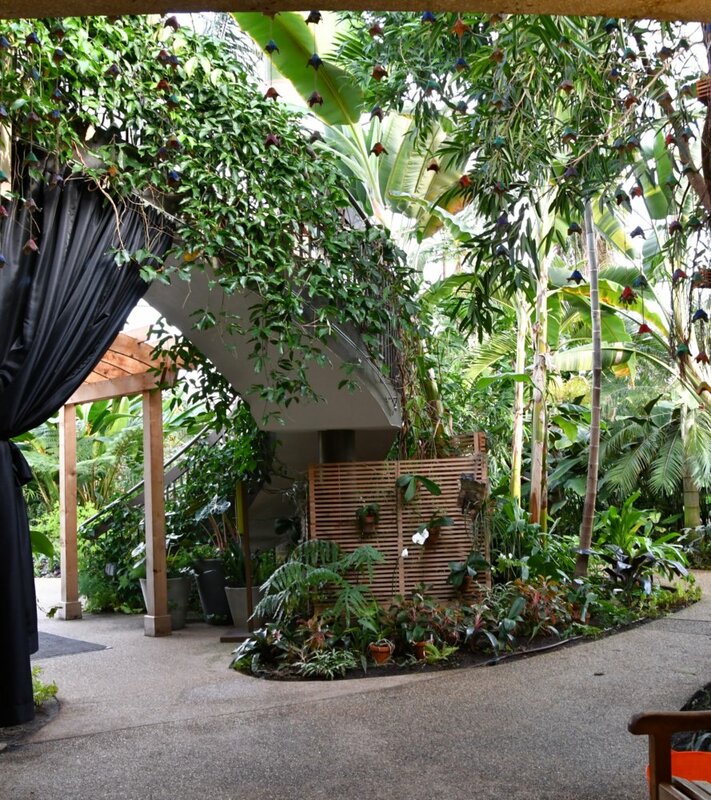 Our royal palm towers above the conservatory balcony. 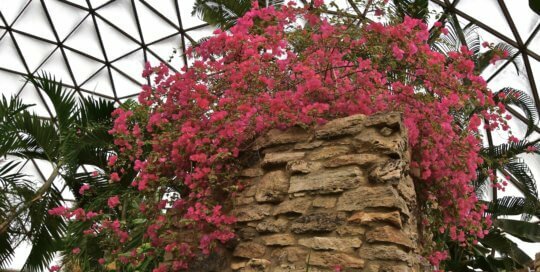 A view near the top of the conservatory with Bougainvillea 'Raspberry Ice' accenting the frame. 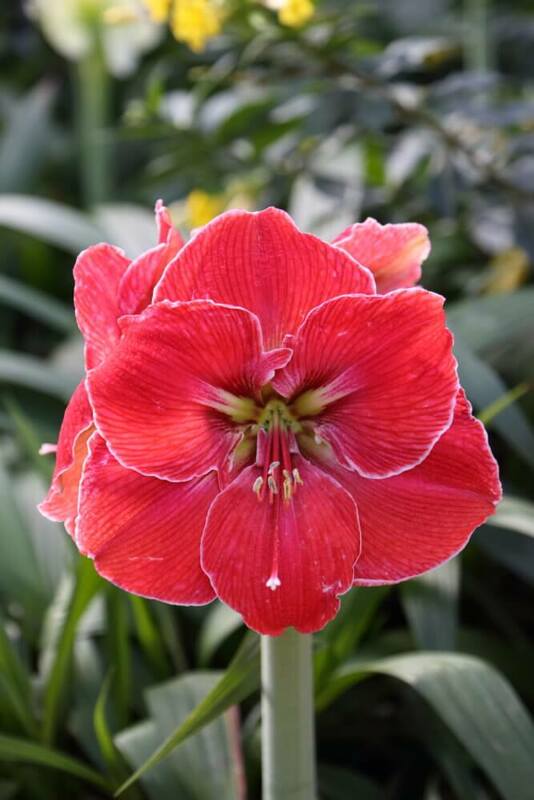 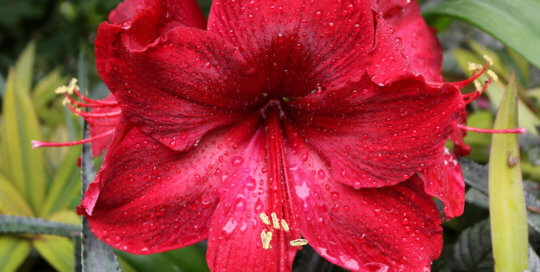 Hippeastrum 'Rapido' stuns viewers with its deep scarlet red bloom. 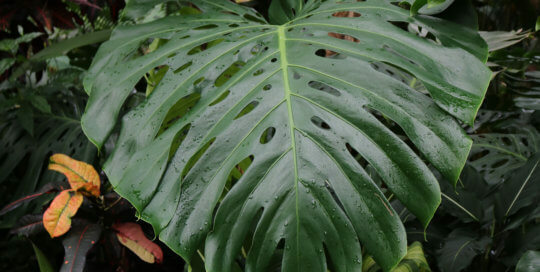 Monstera deliciosa (swiss cheese plant) casting shadows in the conservatory. 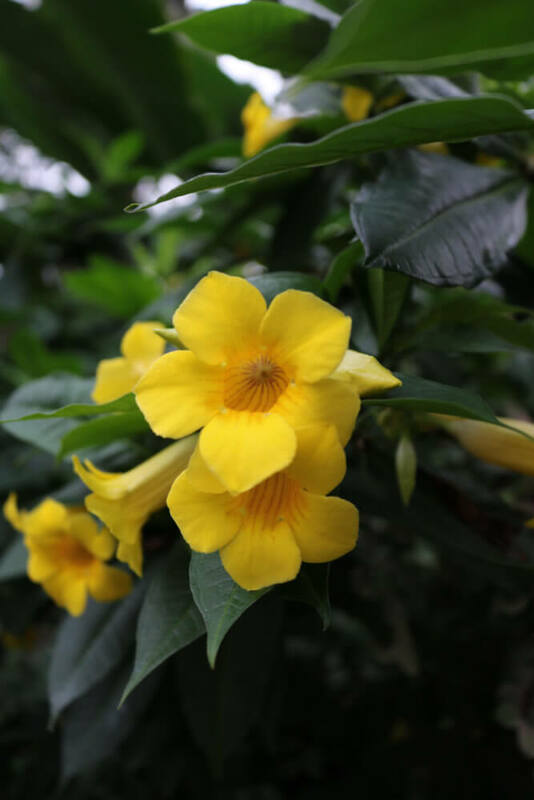 Allamanda schottii (bush allamanda) captures visitors' attention along the conservatory path. 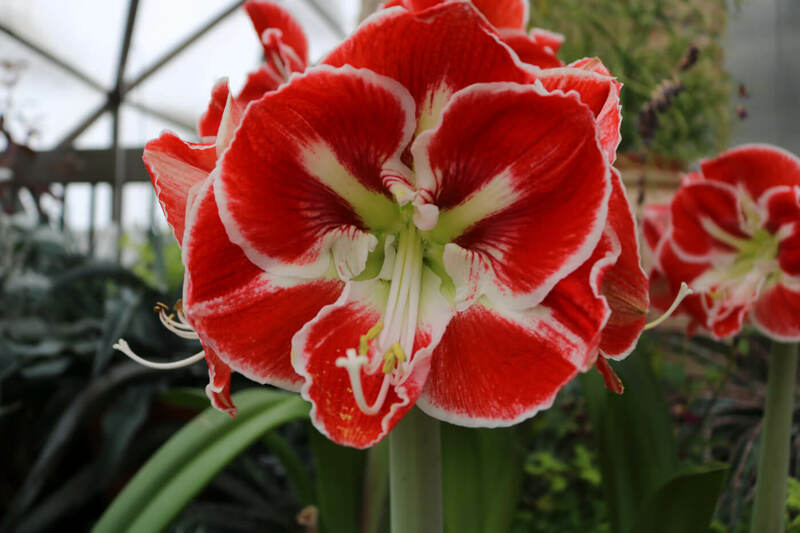 The Hippeastrum 'Flamenco Queen' blooming with notable colors and markings in the conservatory. 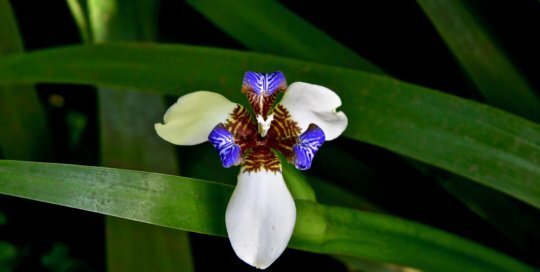 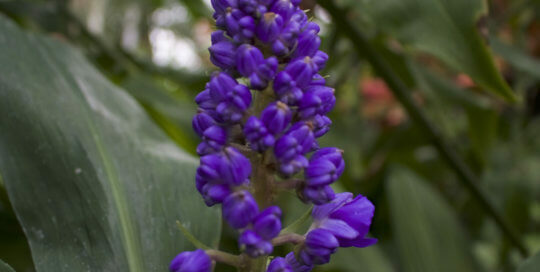 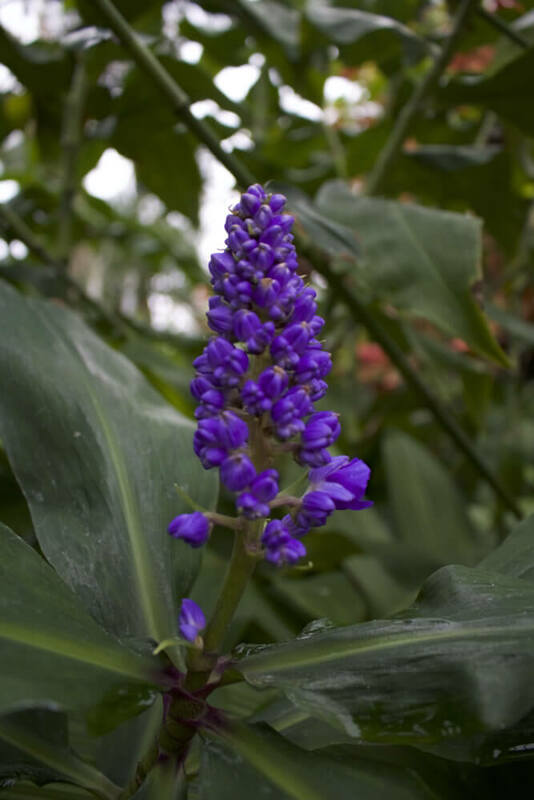 Dichorisandra thyrsiflora (blue ginger) flowering vibrantly in the conservatory. 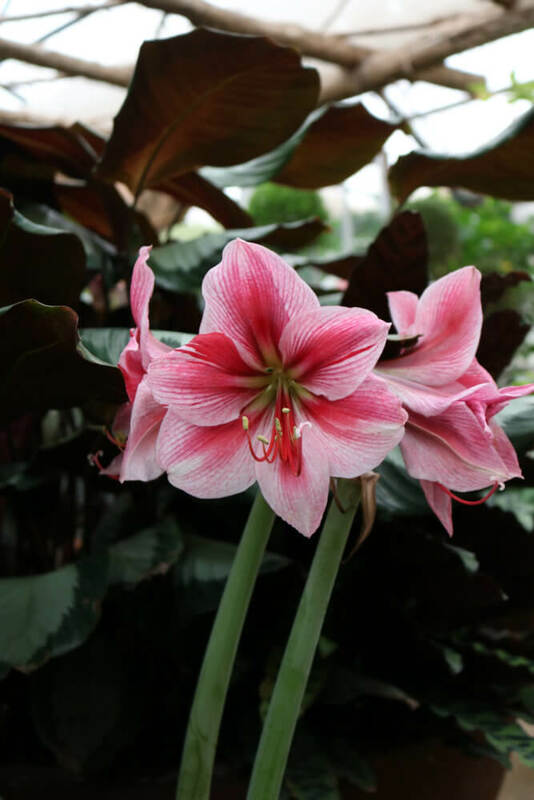 Hippeastrum 'Gervase' stands tall with a beautiful gradient of pinks in the Gardeners Showhouse. 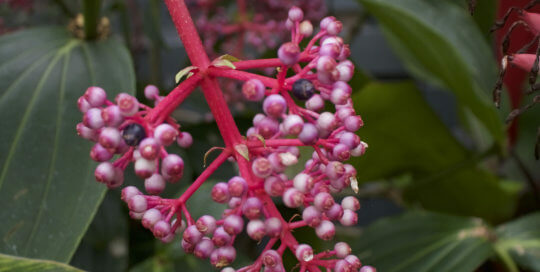 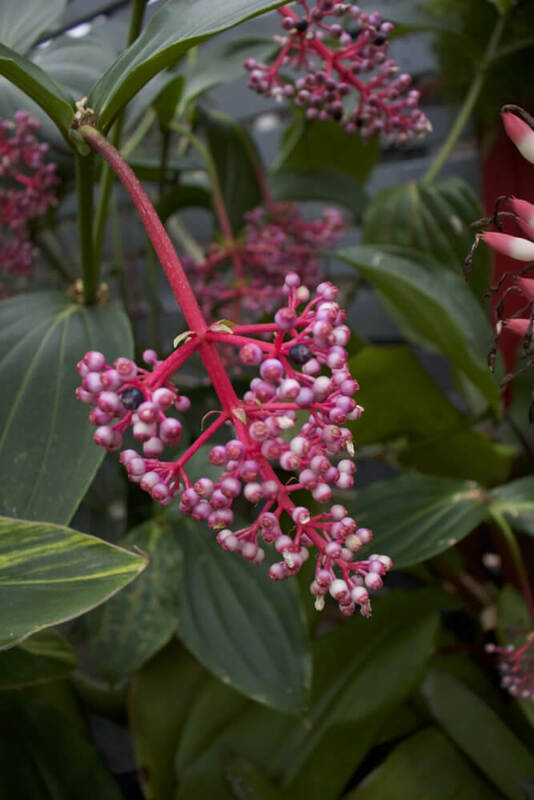 Medinilla myriantha (malaysian orchid) adding a pop of pink to a group of greens. 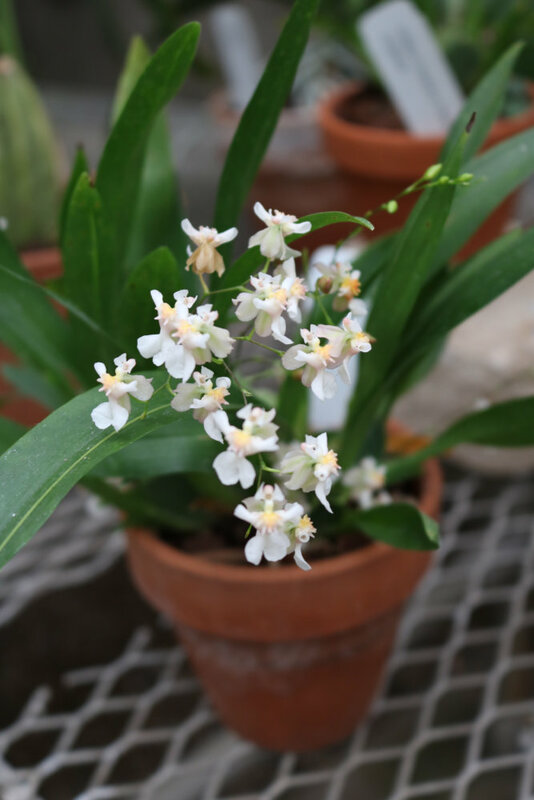 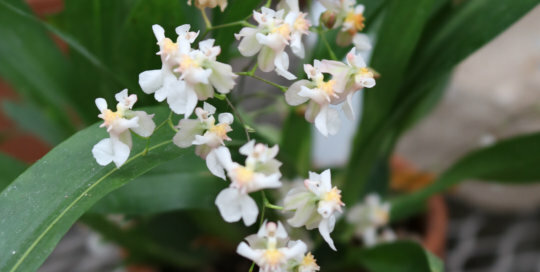 Oncidium Twinkle 'Fantasy' provides delightful container plant inspiration in the Gardeners Showhouse. 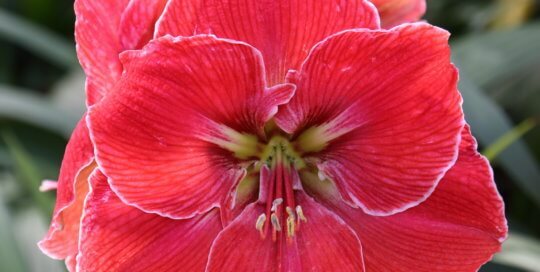 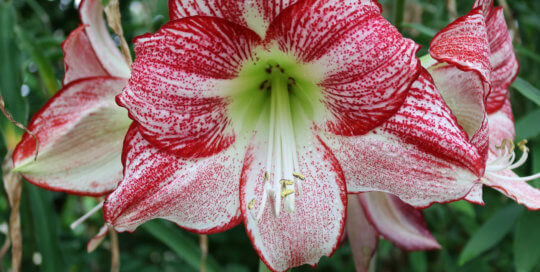 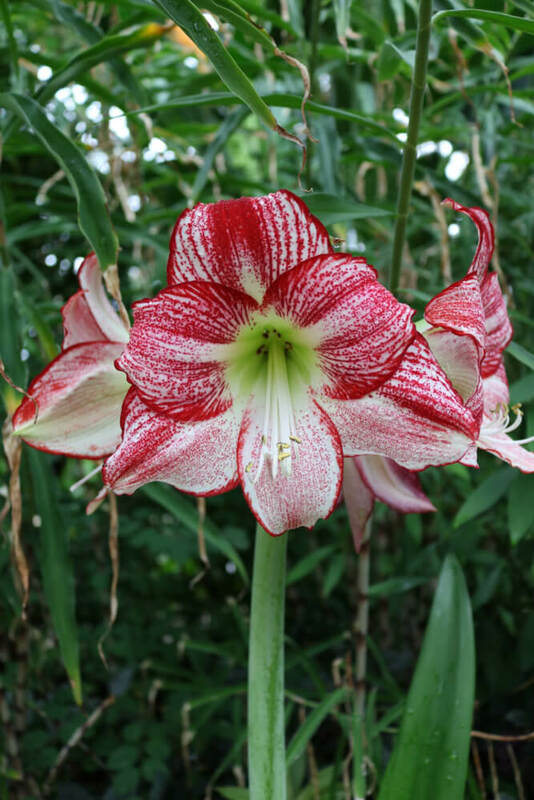 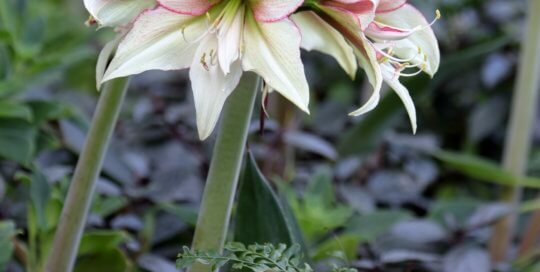 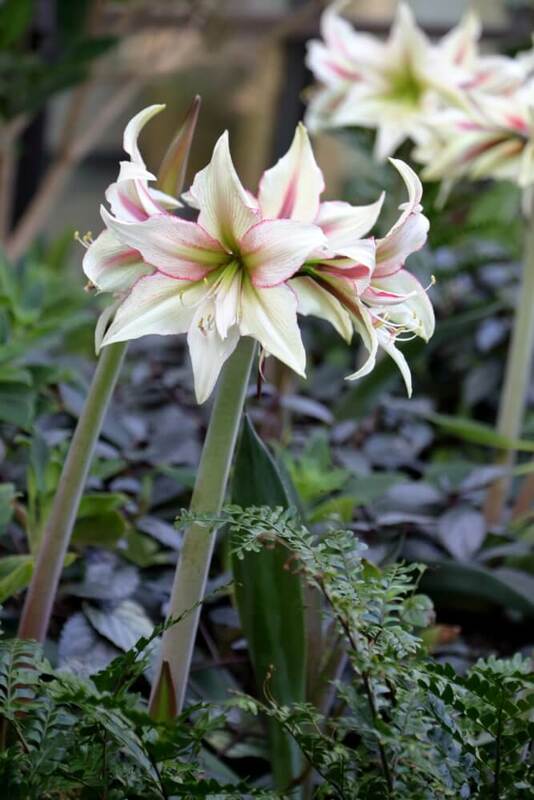 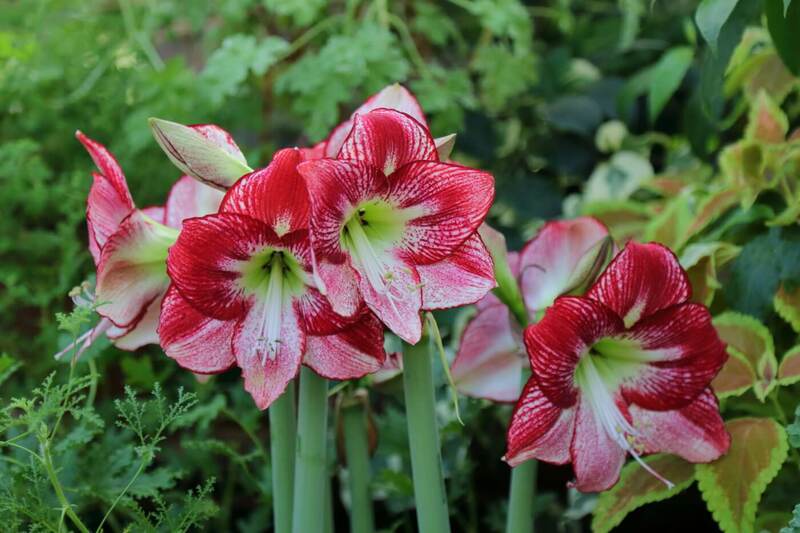 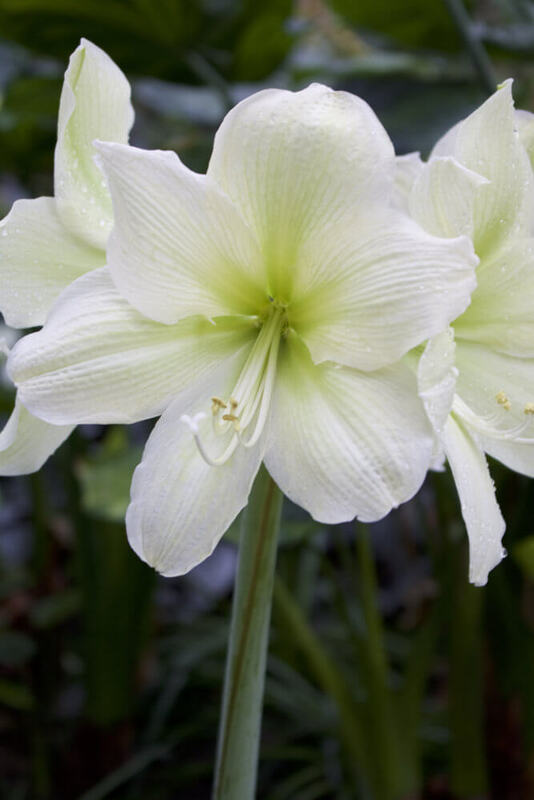 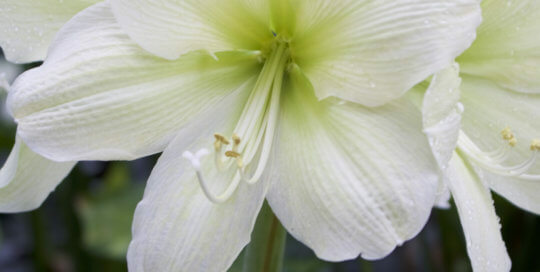 Hippeastrum 'Denver' (Denver amaryllis) is a simple but classic bloom. 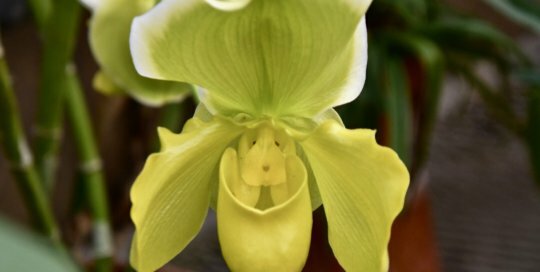 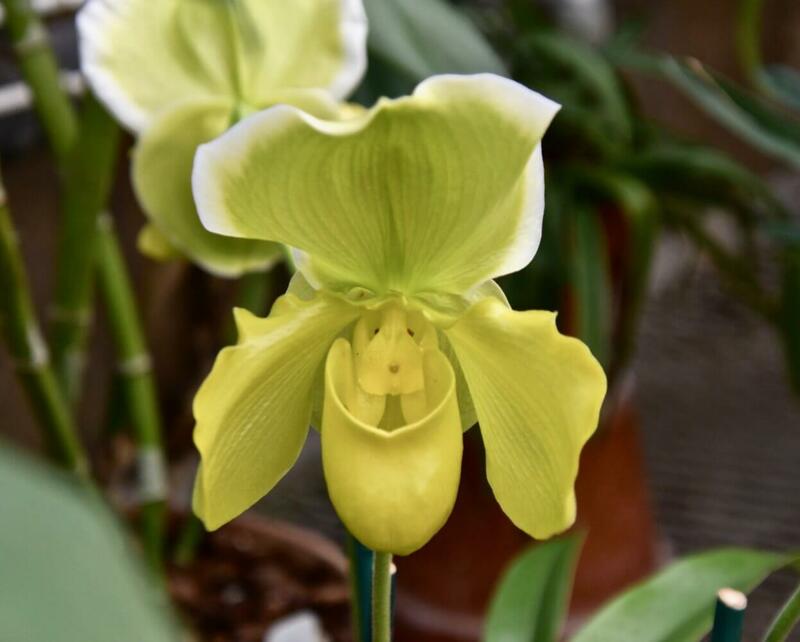 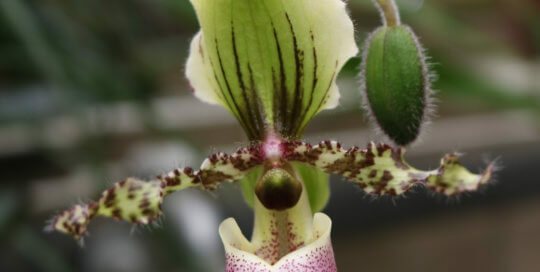 Paphiopedilum victoria-regina stuns viewers while blooming in the Gardeners Showhouse. 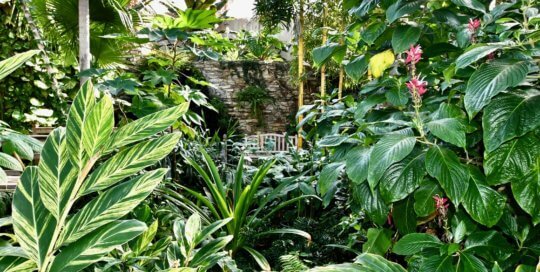 Portea 'Jungles' is striking in the Gardeners Showhouse. 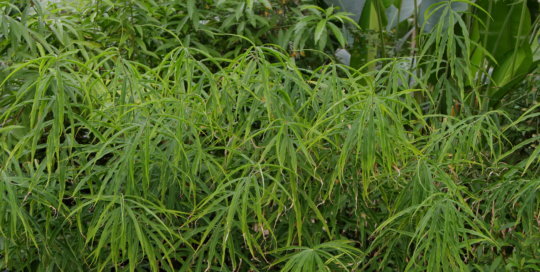 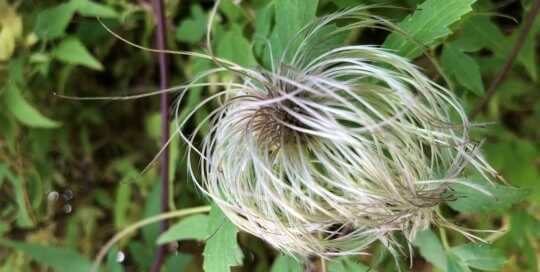 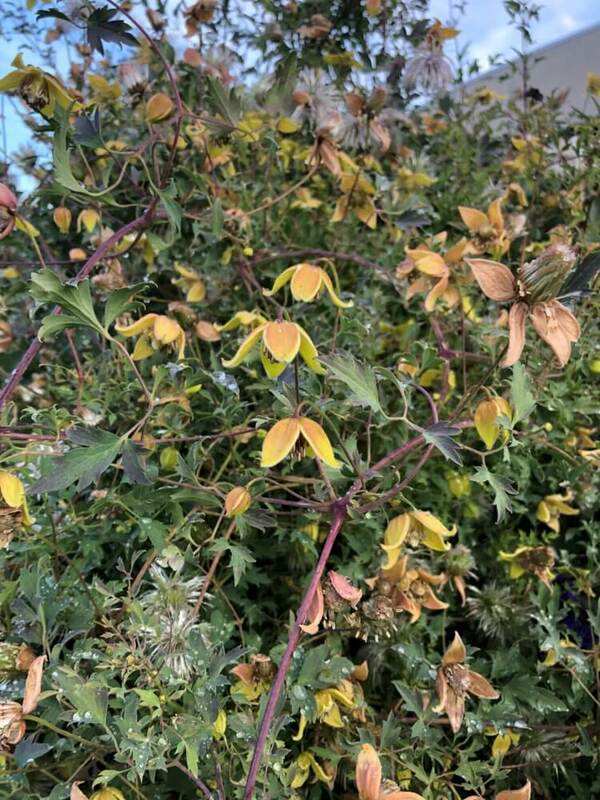 Sanchezia speciosa (shrubby white vein) mesmerizes with its stark leaf outlines. 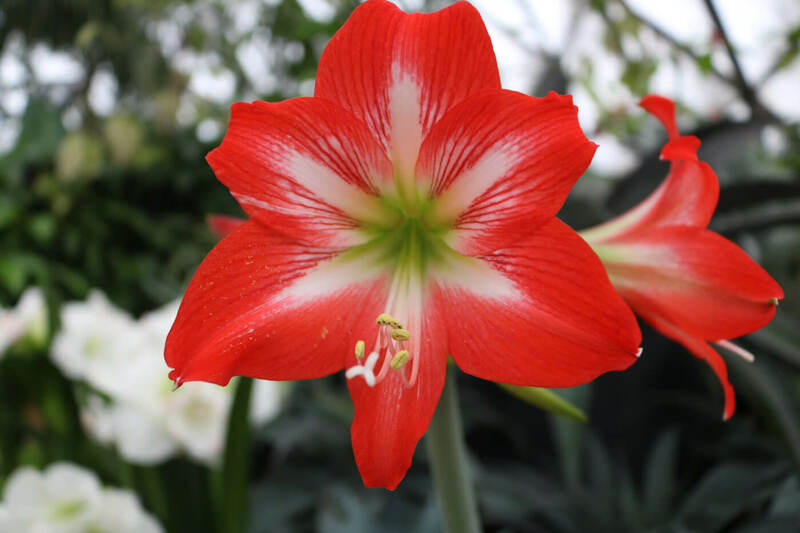 A pop of red in the conservatory from the Hippeastrum 'Samba' (Samba amaryllis). 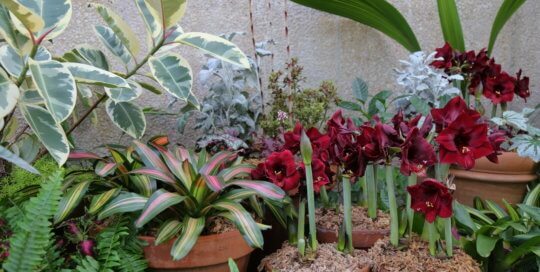 Conservatory container featuring Bergenia 'Green Monster'. 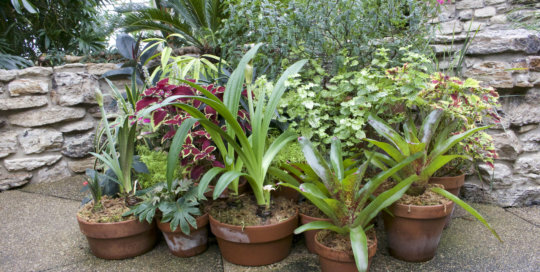 A conservatory container montage featuring Cycas revoluta (sago palm), Neoregelia 'Tango Mango', Asystasia gangetica 'You're So Vein' and Plectranthus sp. 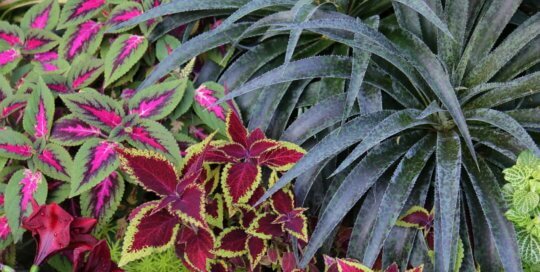 (coleus). 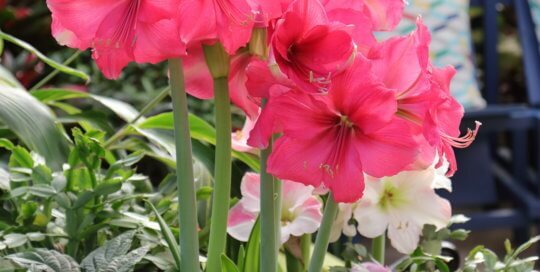 Hippeastrum 'Naranja' adds a punch of orange among green fronds. 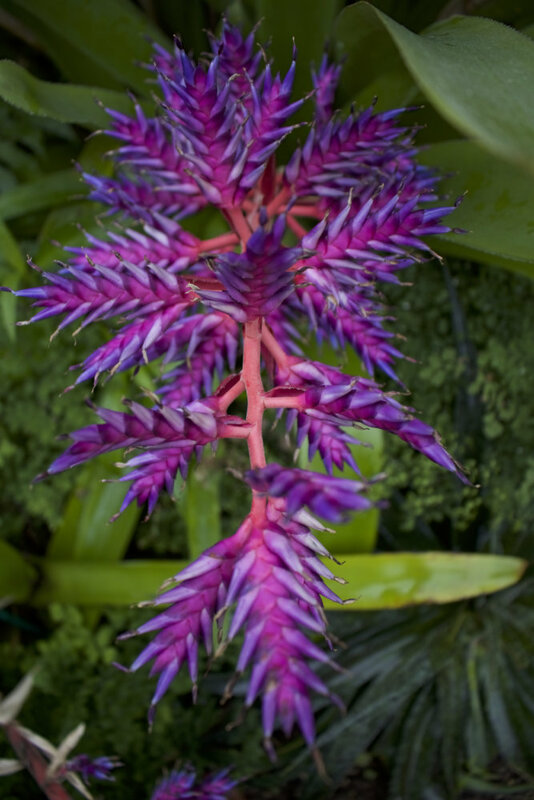 Aechmea 'Blue Tango' commands attention with bright pinks and purples near the conservatory entrance. 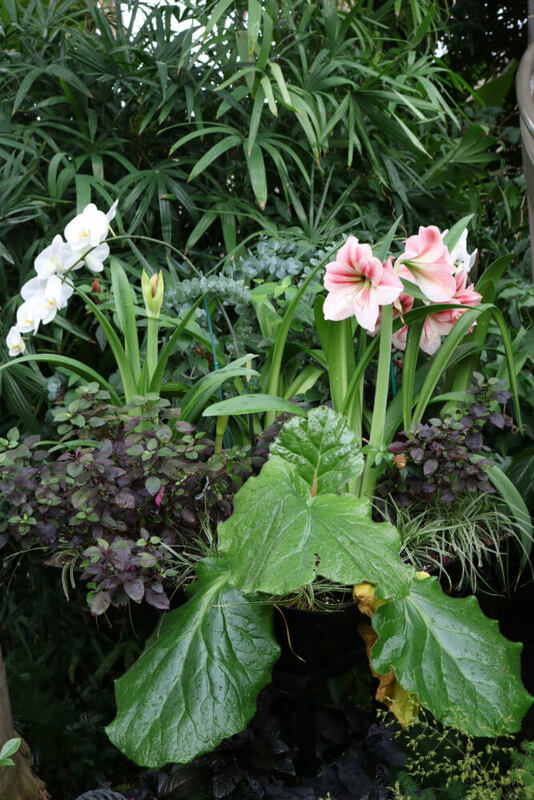 A curated container montage on the conservatory balcony featuring Mangave and 'Baby Star' amaryllis. 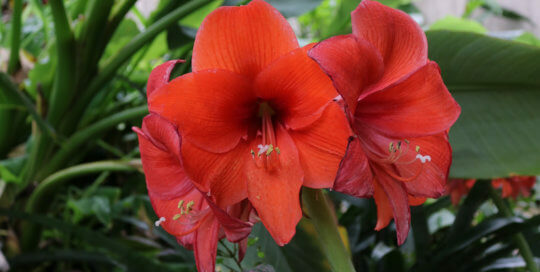 Hippeastrum 'Samba' (Samba amaryllis) in full bloom inside the conservatory. 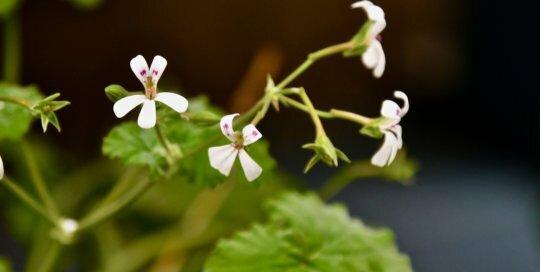 A grouping of Pelargonium sp. 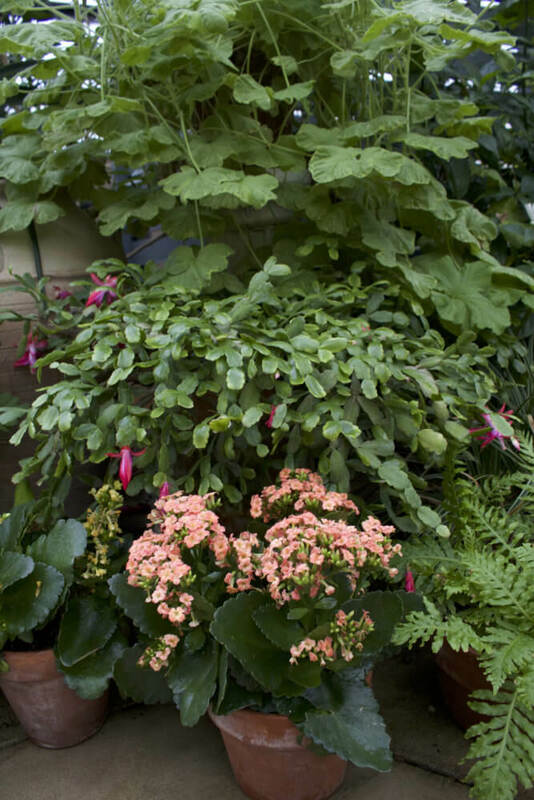 (scented geranium), Schlumbergera sp. 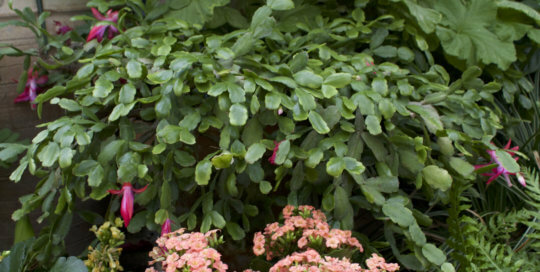 (christmas cactus) and Kalanchoe sp. 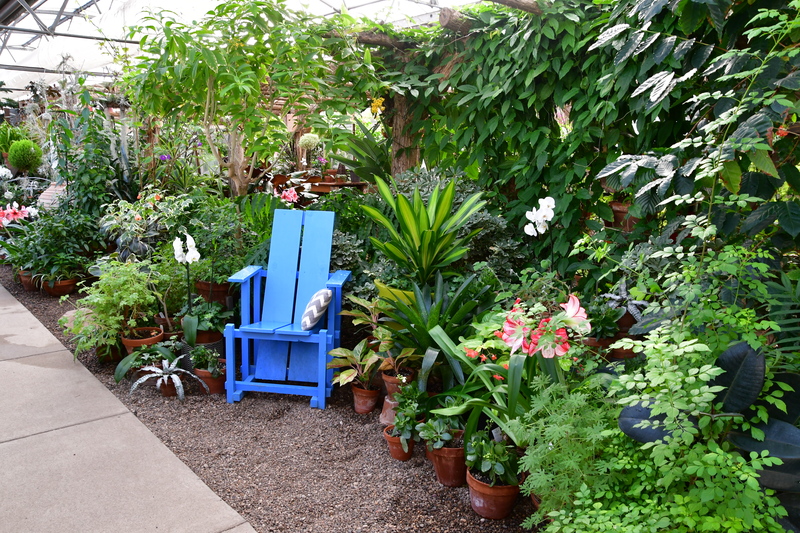 in the Gardeners Showhouse. 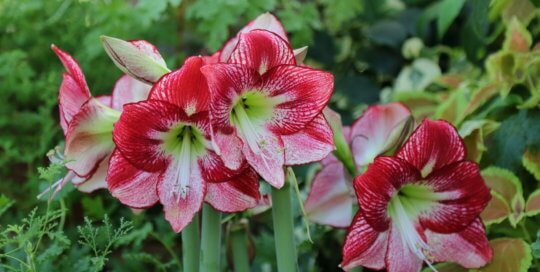 Amaryllis everywhere! 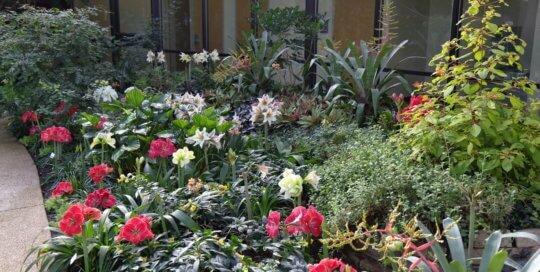 in the conservatory, Dec. 14. 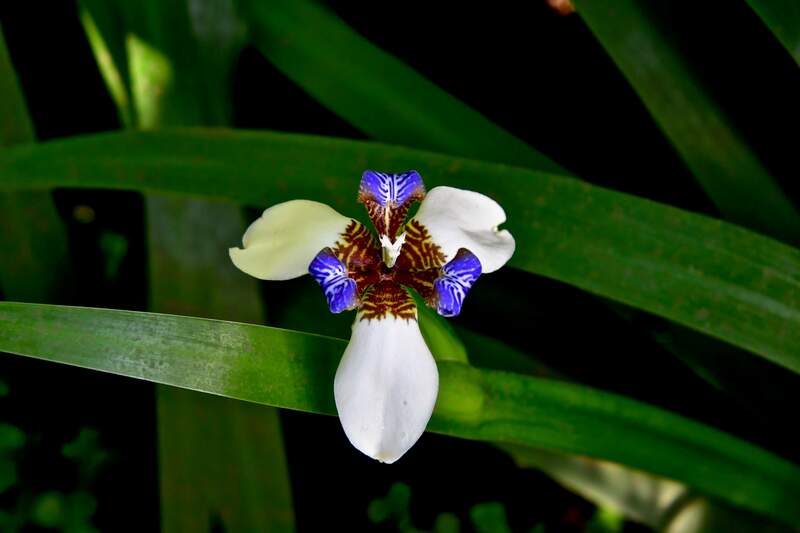 Photo by Kelly Norris. 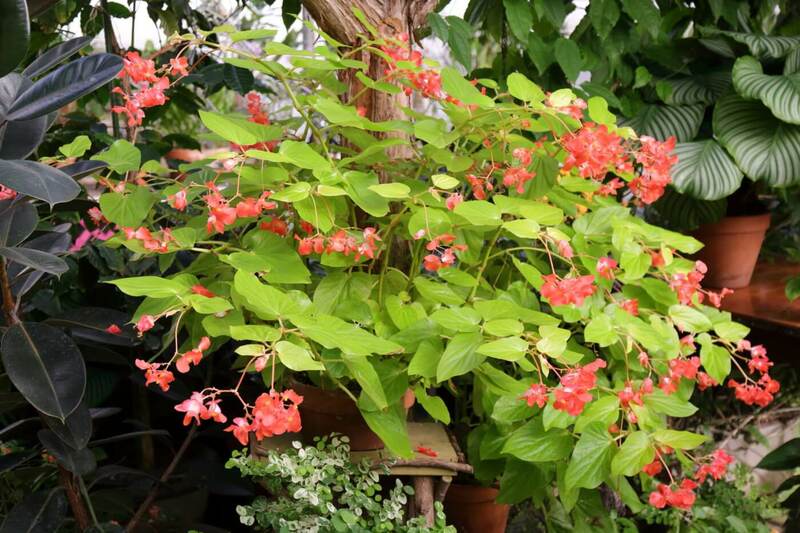 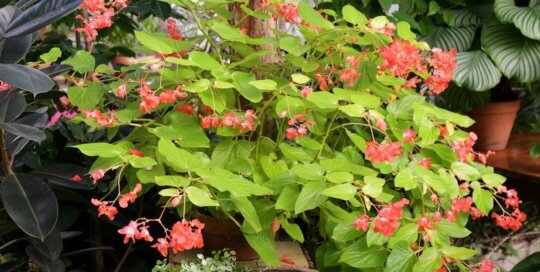 Begonia 'Canary Wings' (Canary Wings begonia) in the Gardeners Show House. 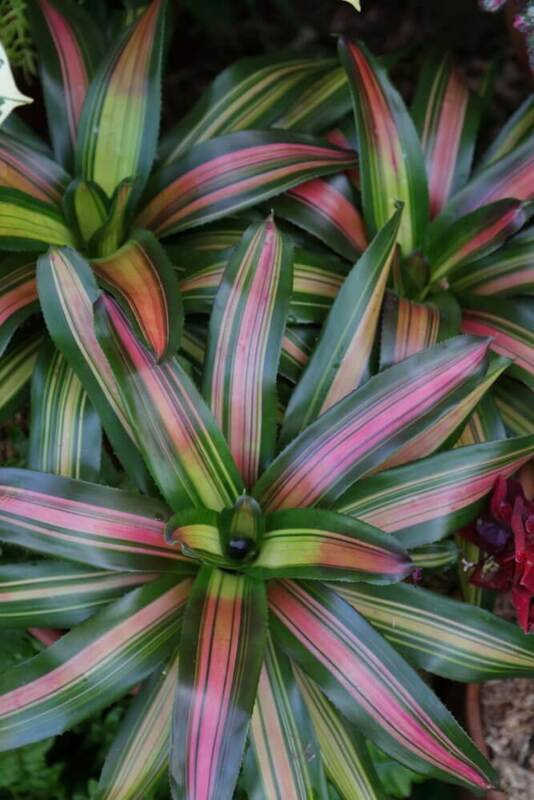 Photo by Kelly Norris. 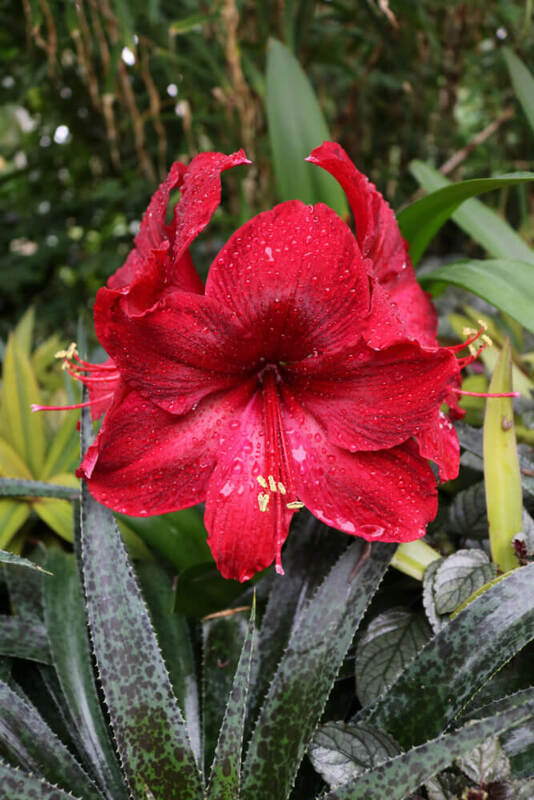 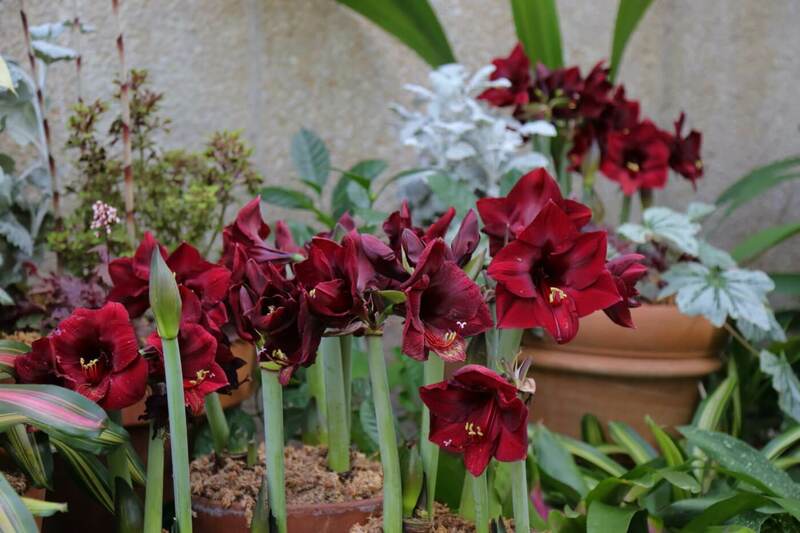 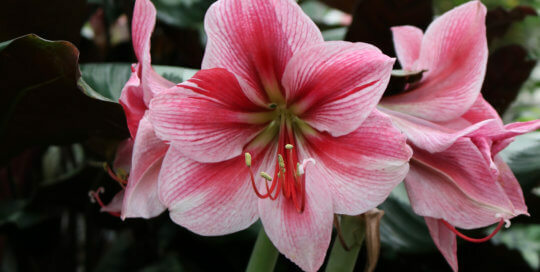 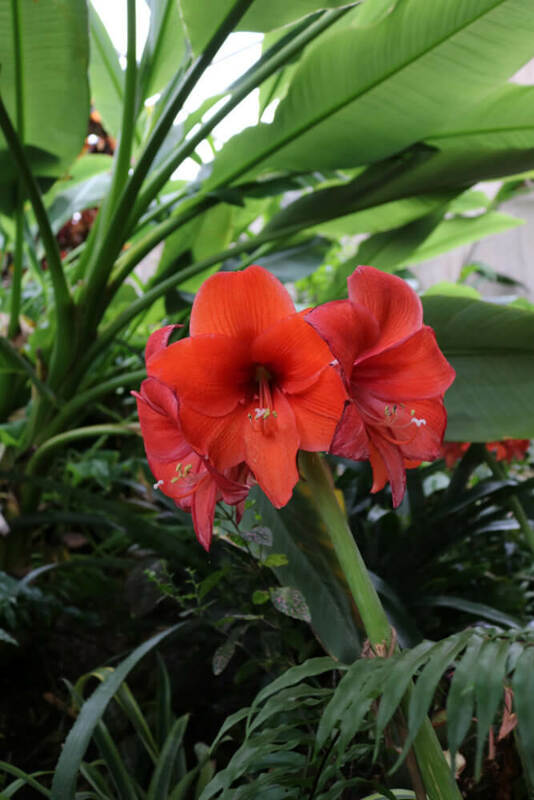 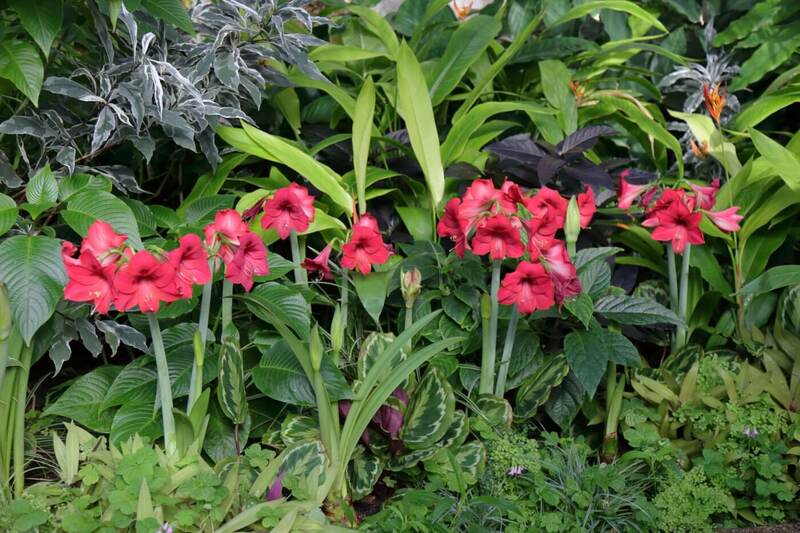 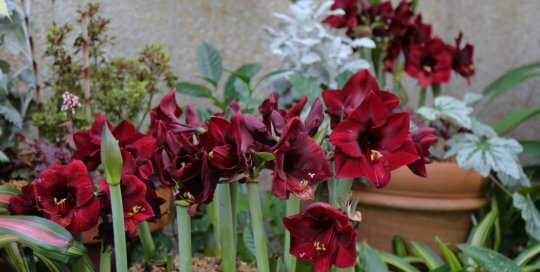 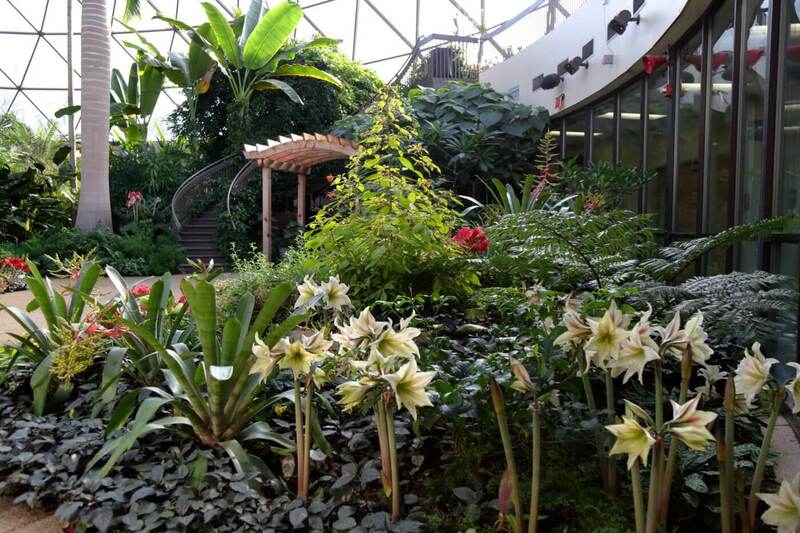 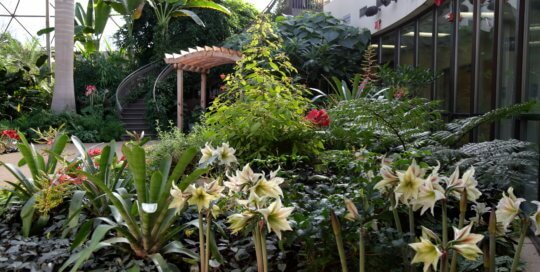 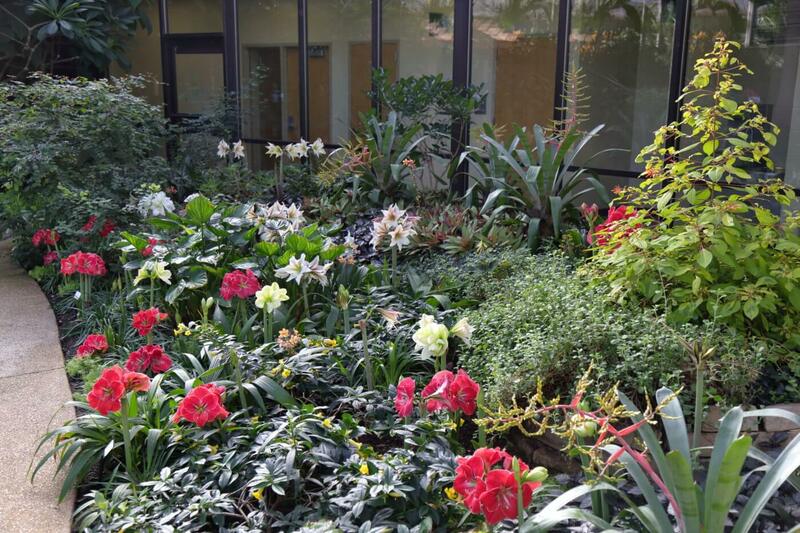 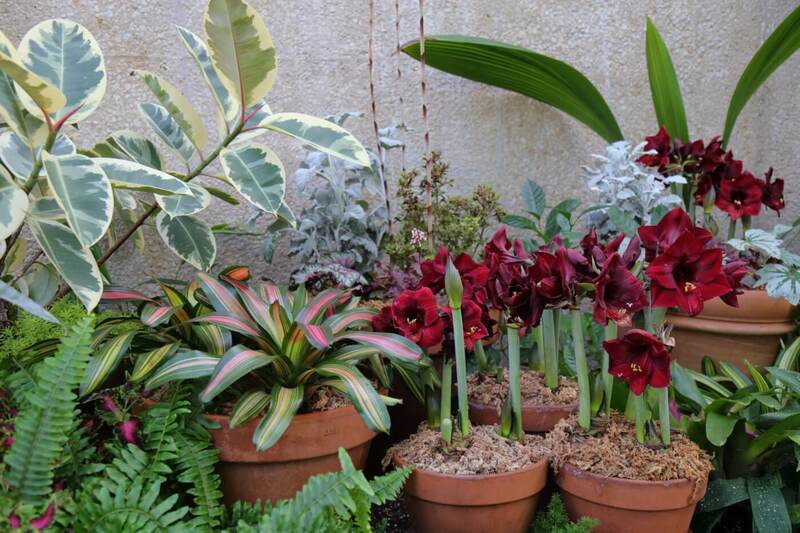 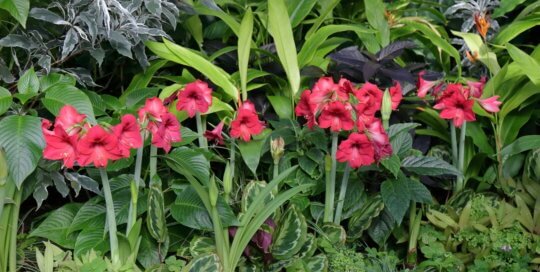 Colorful foliage and amaryllis abound in the conservatory throughout the holiday season. 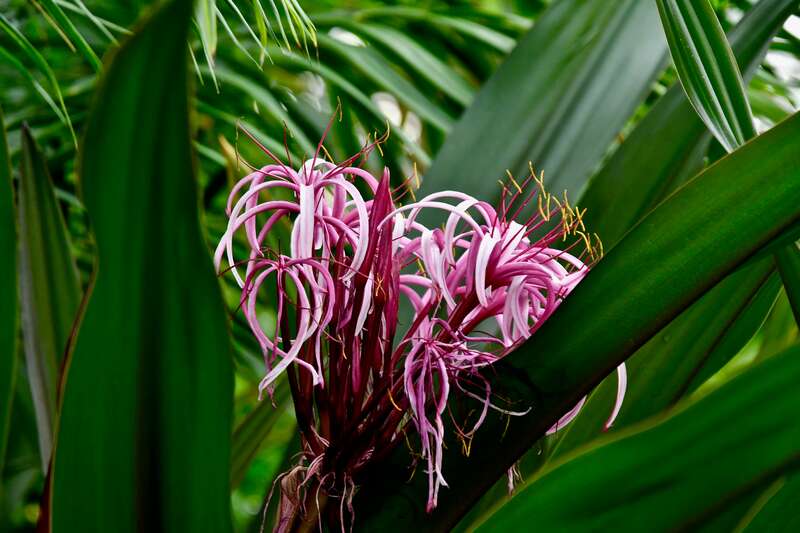 Photo by Kelly Norris. 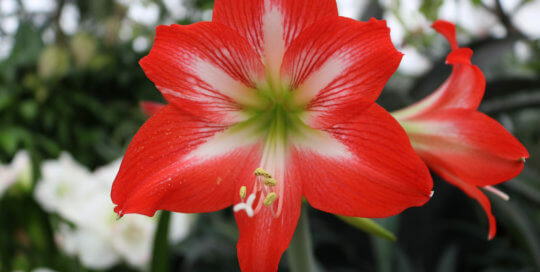 Hippeastrum 'Amadeus' (Amadeus amaryllis) in the conservatory, December 14. 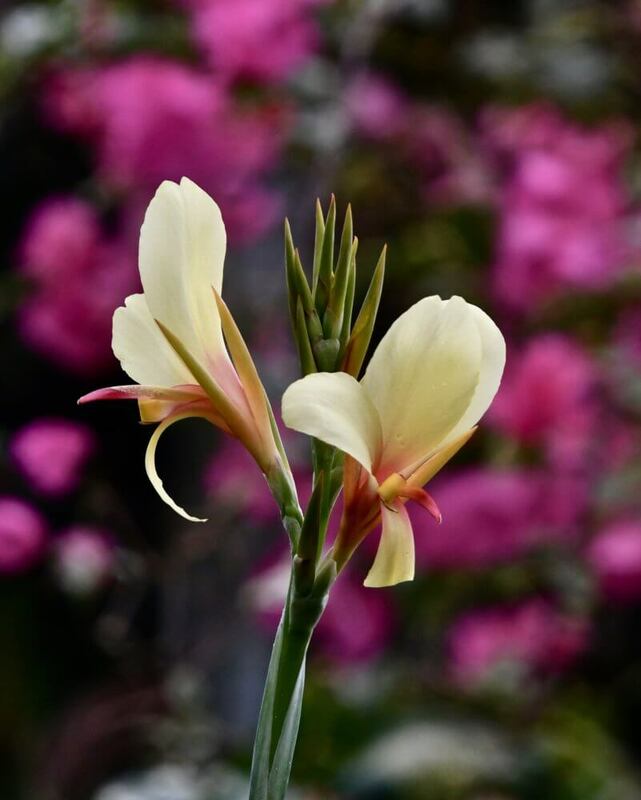 Photo by Kelly Norris. 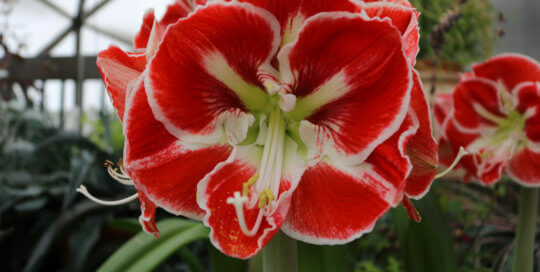 Hippeastrum 'Red Sovereign' (Red Sovereign amaryllis) showing off the in the conservatory. 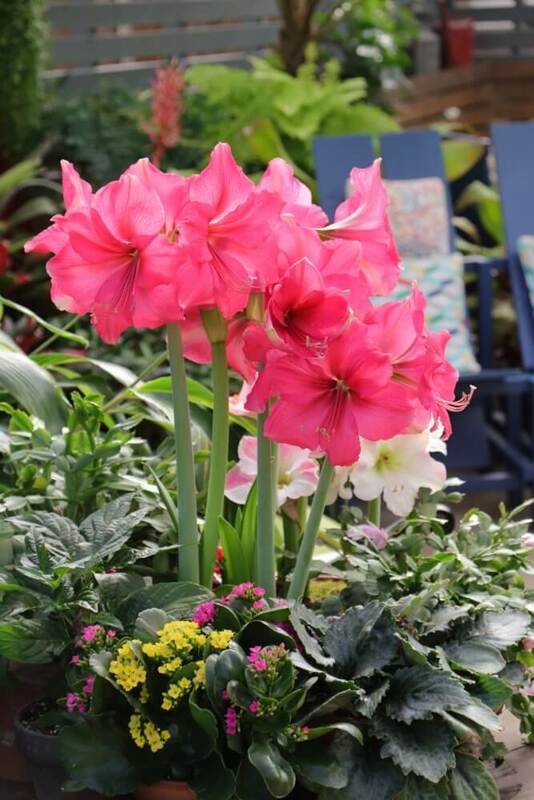 Photo by Kelly Norris. 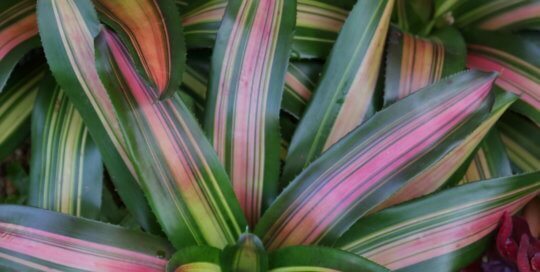 Neoreglia 'Cookie' (Cookie bromeliad). 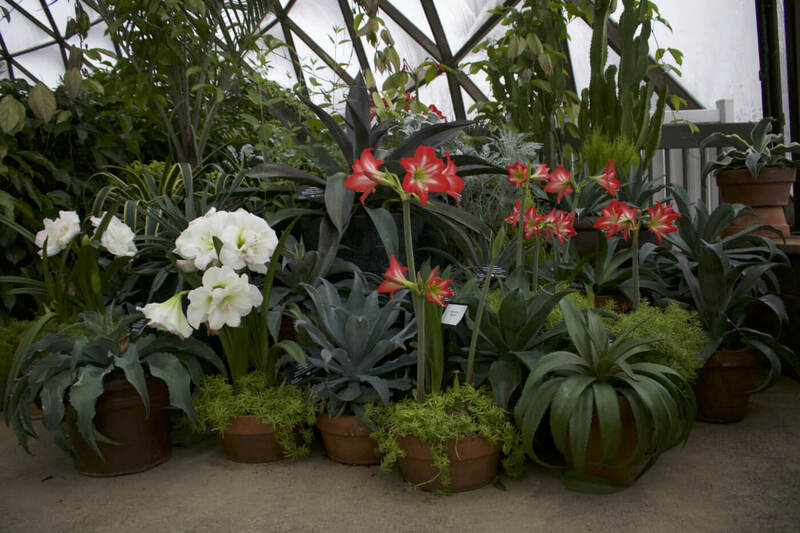 Photo by Kelly Norris. 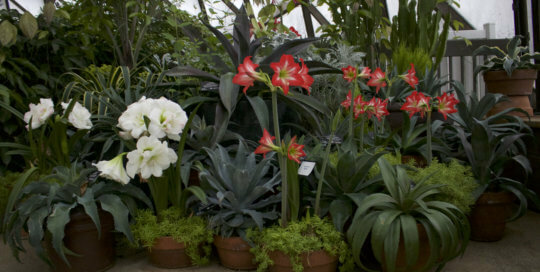 The Gardeners Show House shines during the holiday season. 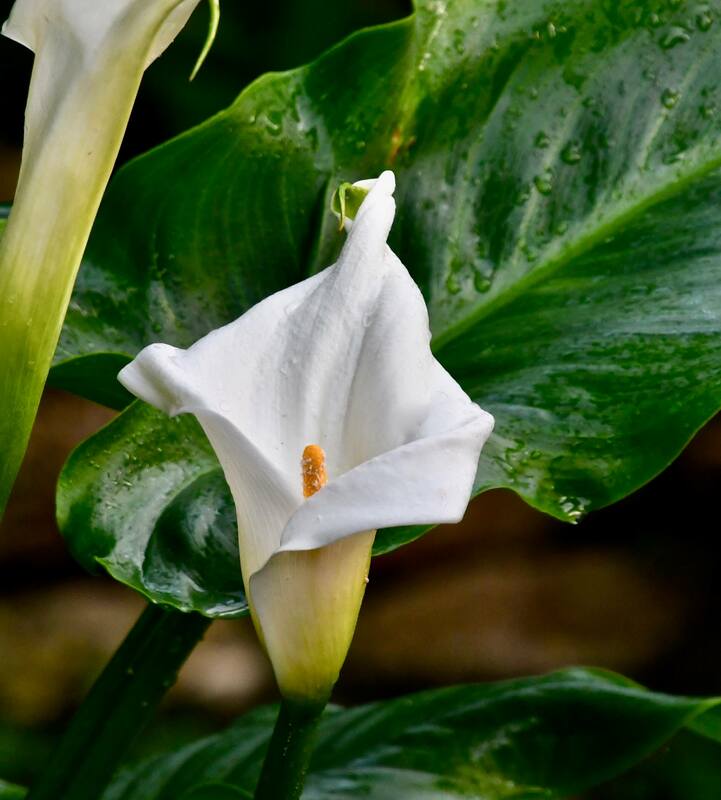 Photo by Kelly Norris. 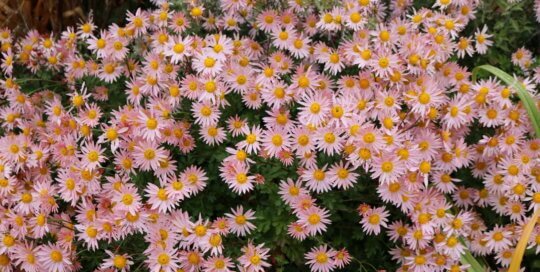 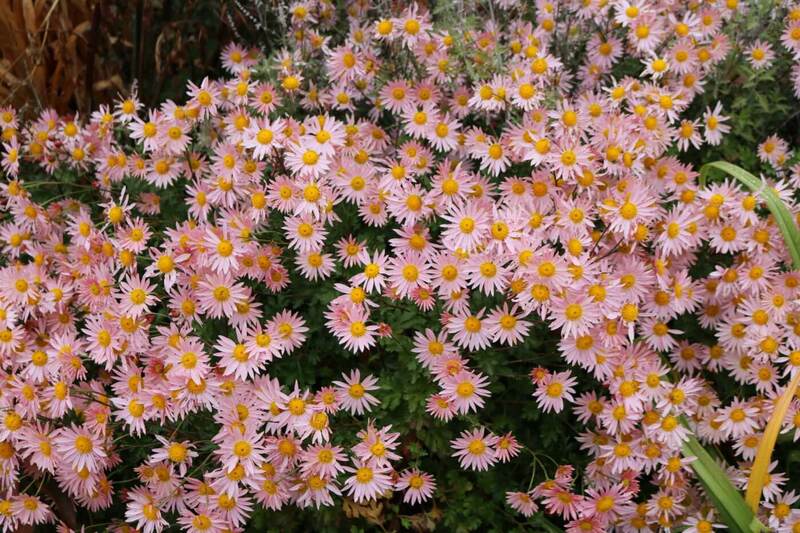 A mass of Chrysanthemum 'Sheffield Pink' blooms late in the season in the Koehn Perennial border. 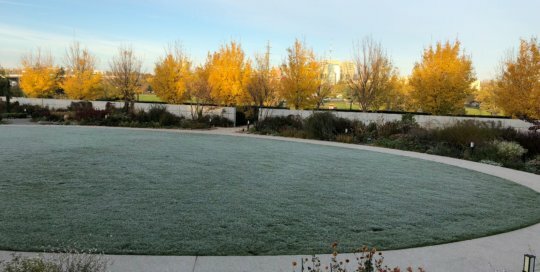 Photo by Leslie Hunter 11.2.18. 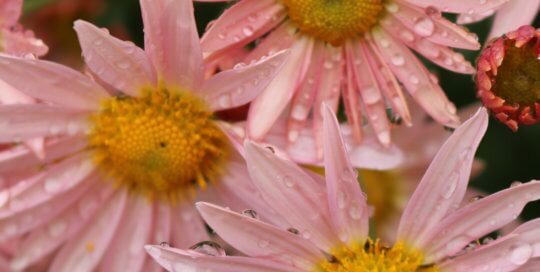 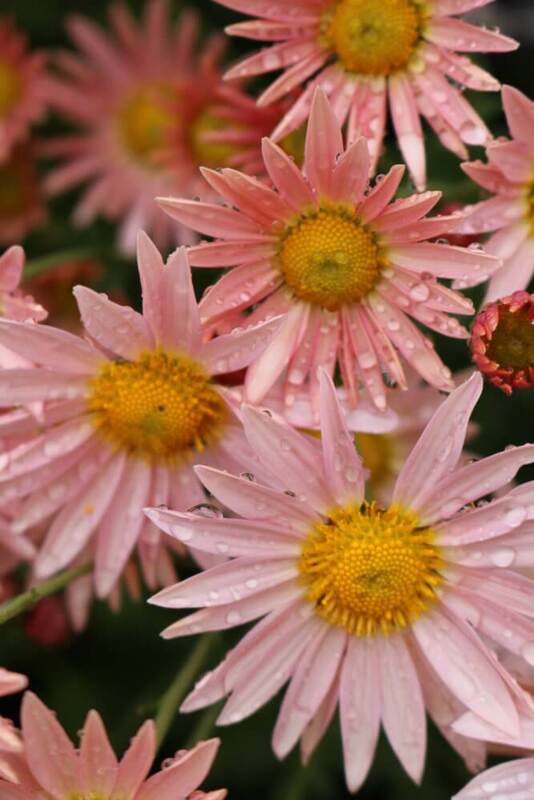 Close up of Chrysanthemum 'Sheffield Pink' in the Koehn Garden. 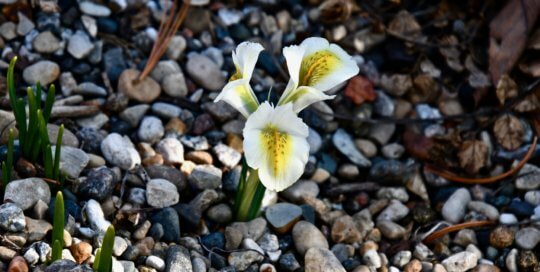 Photo by Leslie Hunter 11.2.18. 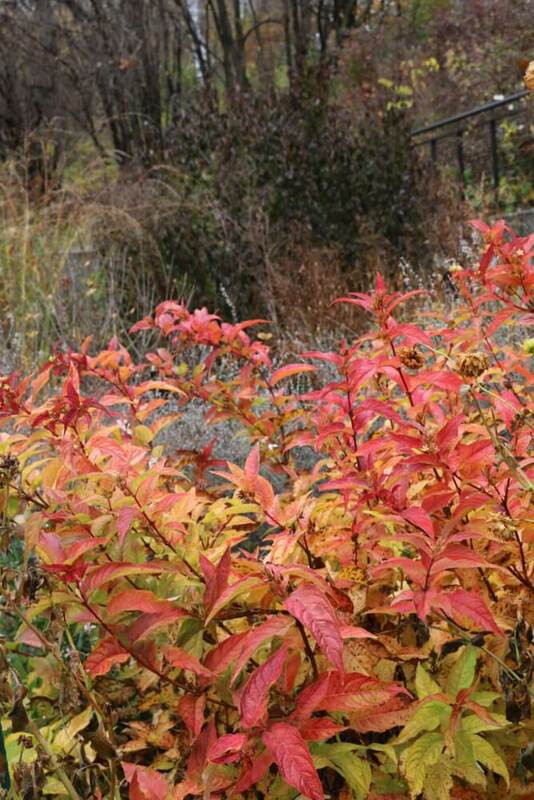 Diervilla x 'Kodiak Orange' bush honeysuckle lights up the fall landscape in the Koehn Garden. 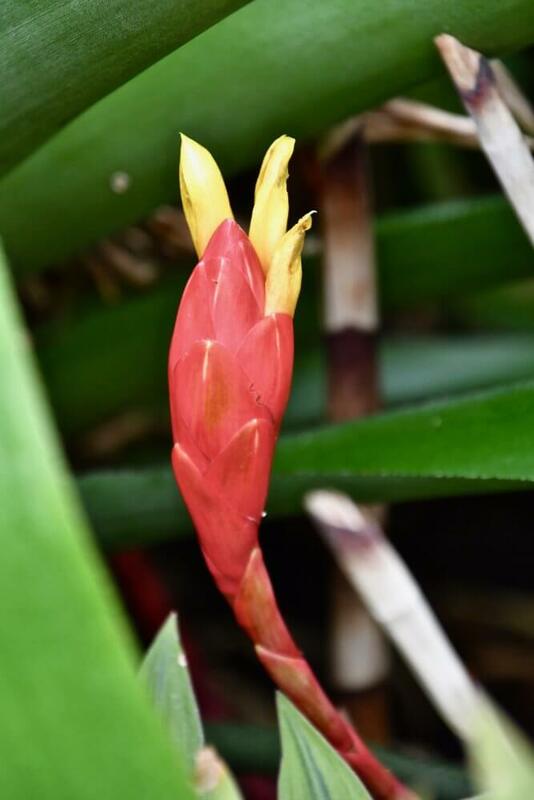 Photo by Leslie Hunter 11.2.18. 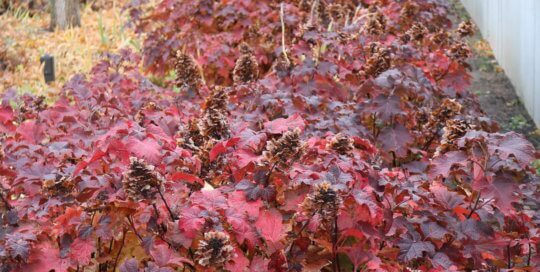 Hydrangea quercifolia 'Ruby Slipper' oakleaf hydrangea glows under the golden leaves of the maples along the Ruan Allee. 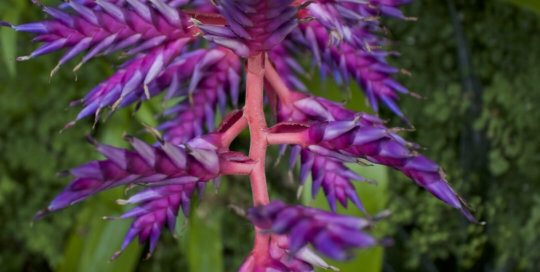 Photo by Leslie Hunter. 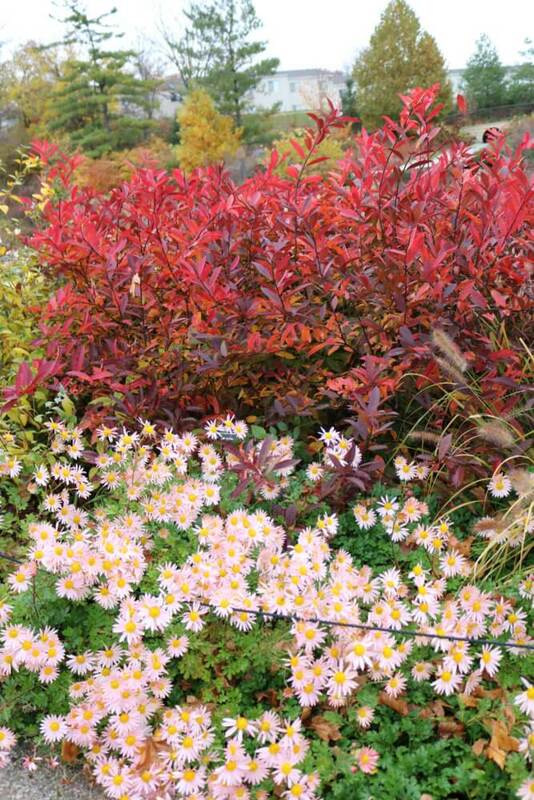 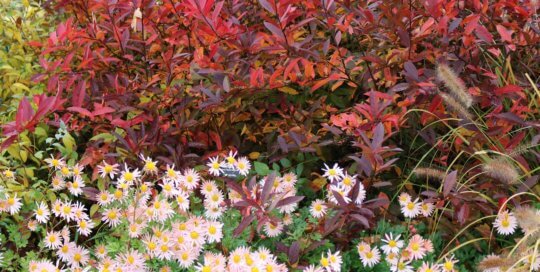 Itea virginica 'Henry's Garnet' and Chrysanthemum 'Sheffield Pink' make a nice pair in the Koehn Garden. 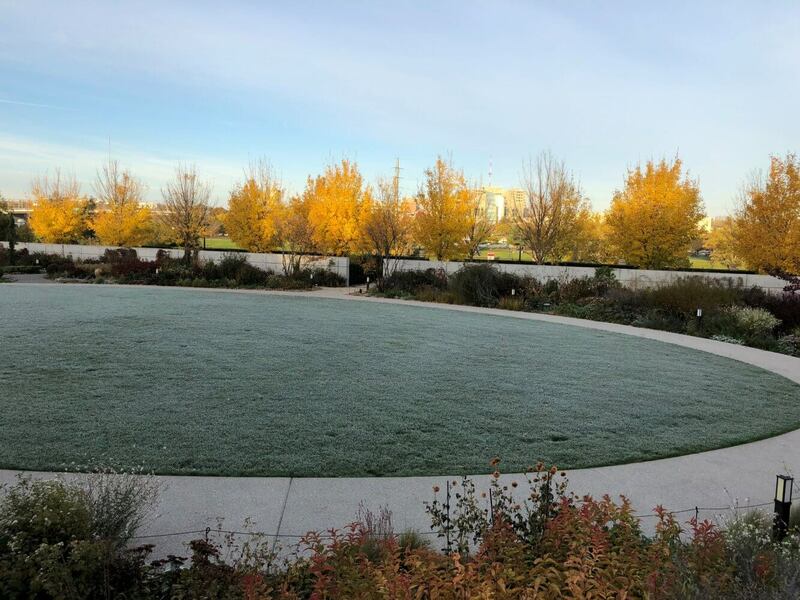 Photo by Leslie Hunter on 11.2.18. 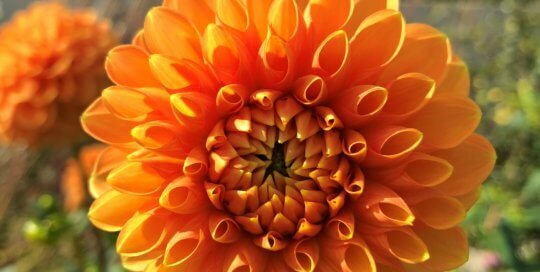 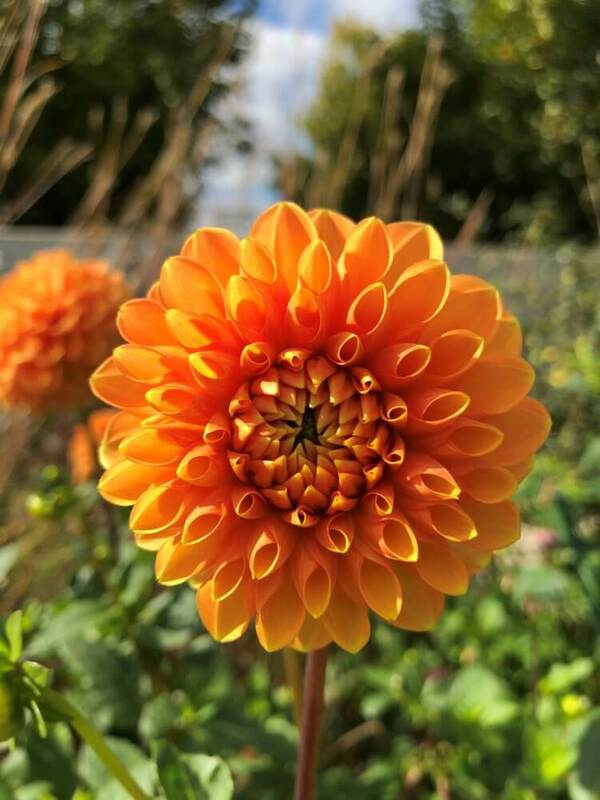 Rich orange of Dahlia 'Maarn' lights up the Koehn Garden perennial border in October. 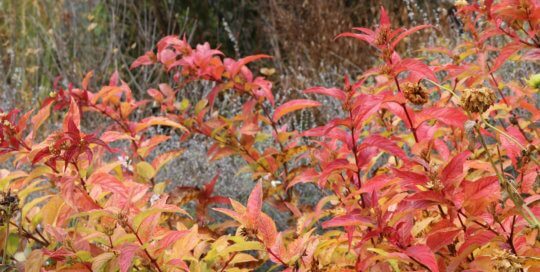 Photo by Leslie Hunter, Oct. 11, 2018. 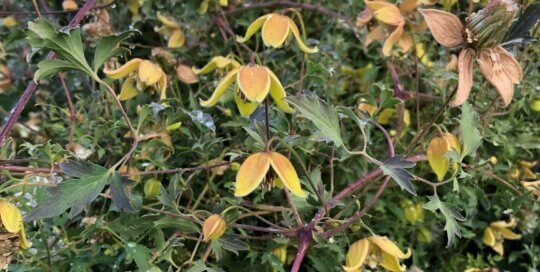 Clemtis tibetana blooms in the rose garden with their orange peel like flowers. 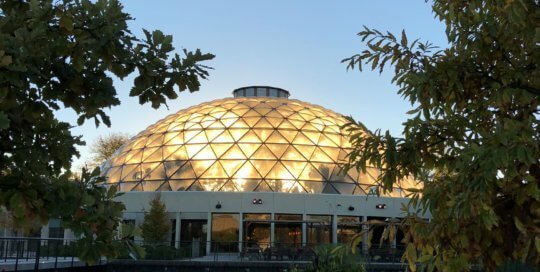 Photo by Leslie Hunter, October 26, 2018. 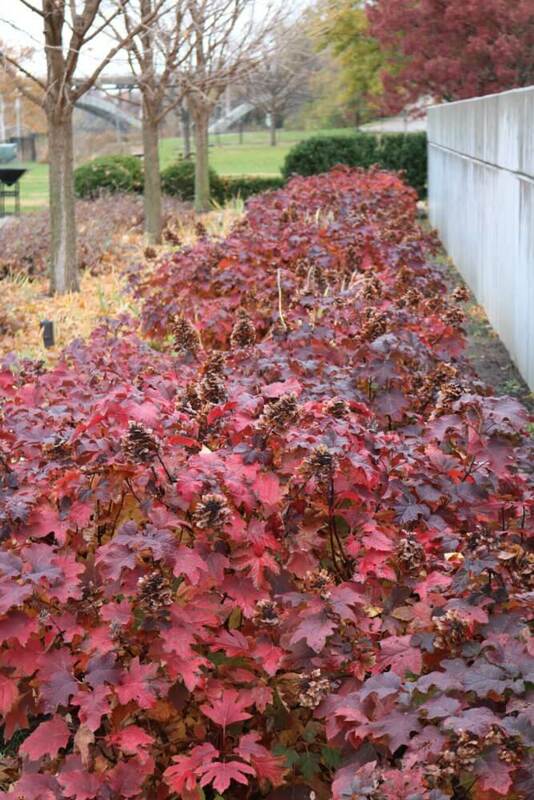 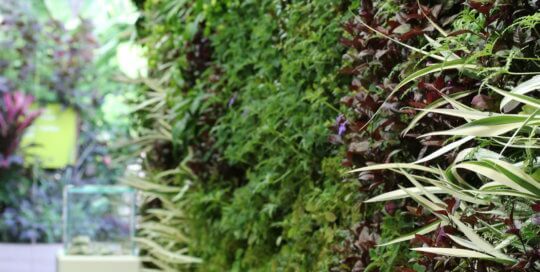 Come see the new plants and design to the Prairie Meadows Living Wall. 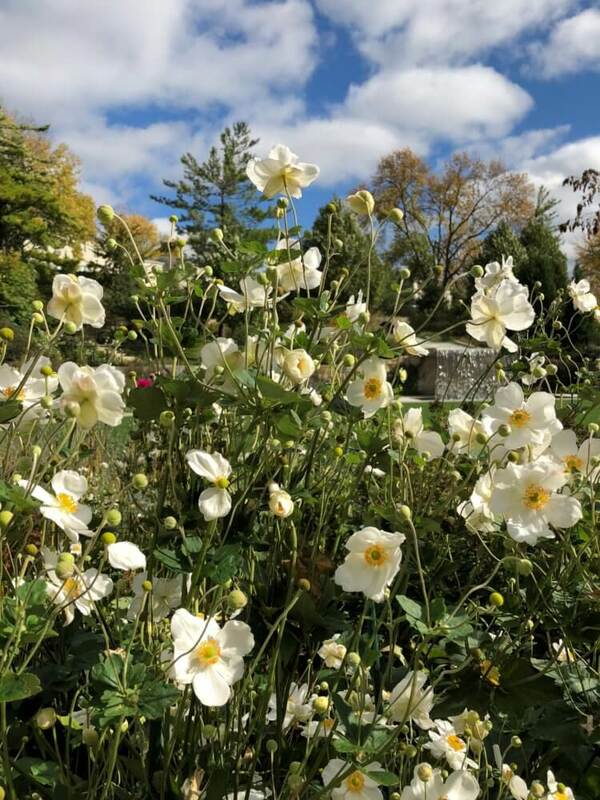 Photo by Hannah Loy Oct. 4, 2018. 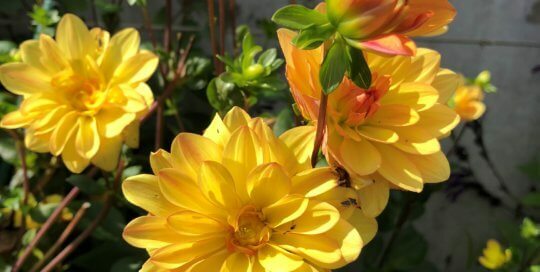 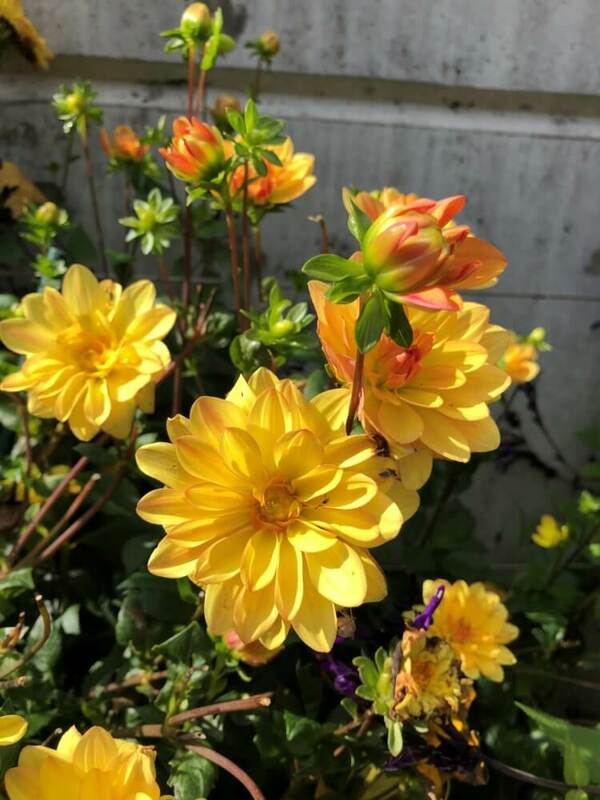 Dahlia 'Cancun' glows yellow along the esplaier wall in the Koehn garden. 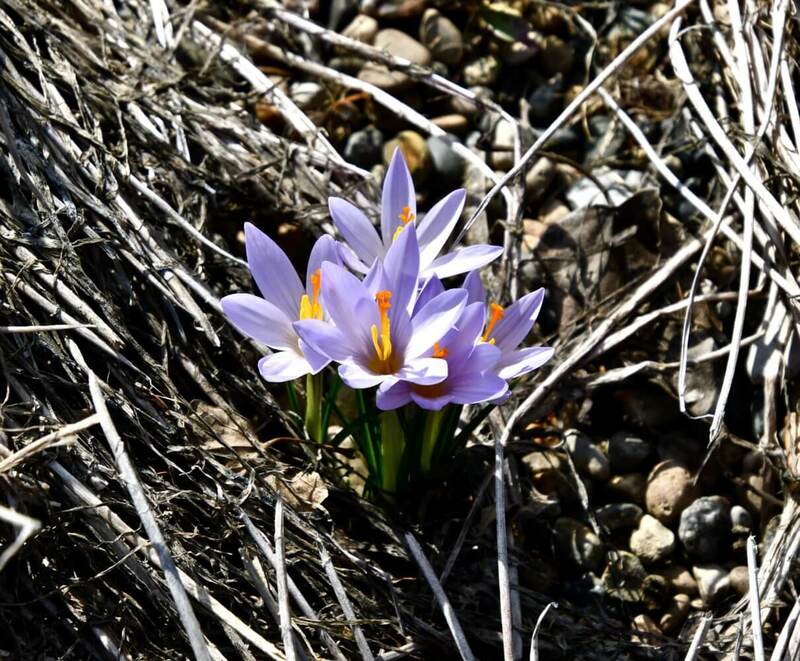 Photo by Leslie Hunter, Oct. 11, 2018. 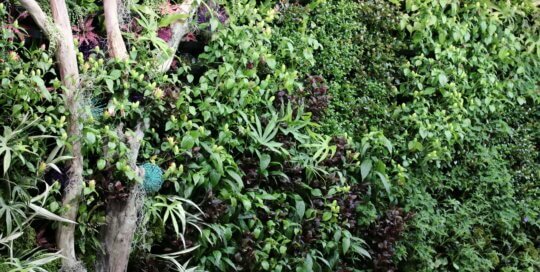 Espalier Wall on a foggy morning. 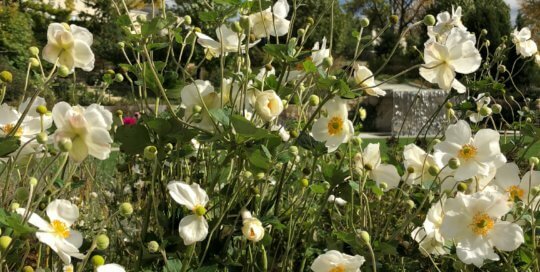 Photo by Leslie Hunter, Oct. 1, 2018. 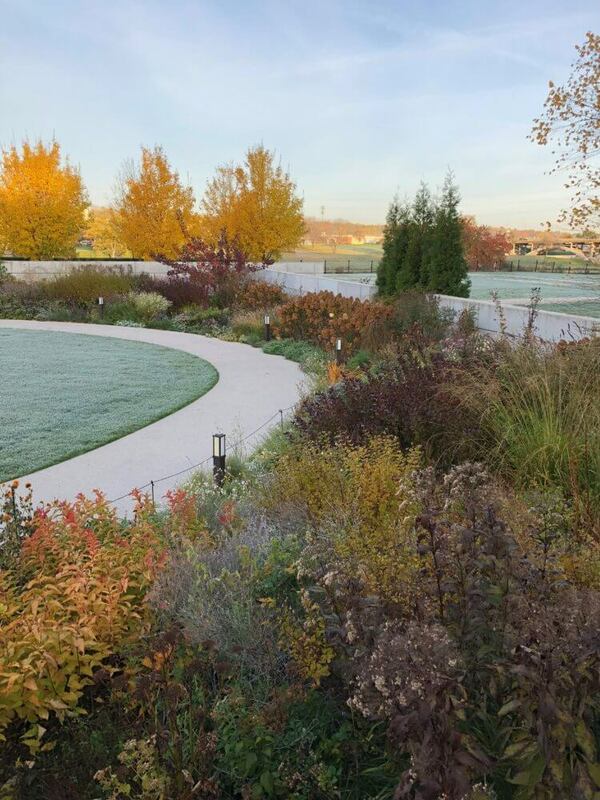 Frost in the Koehn Garden. 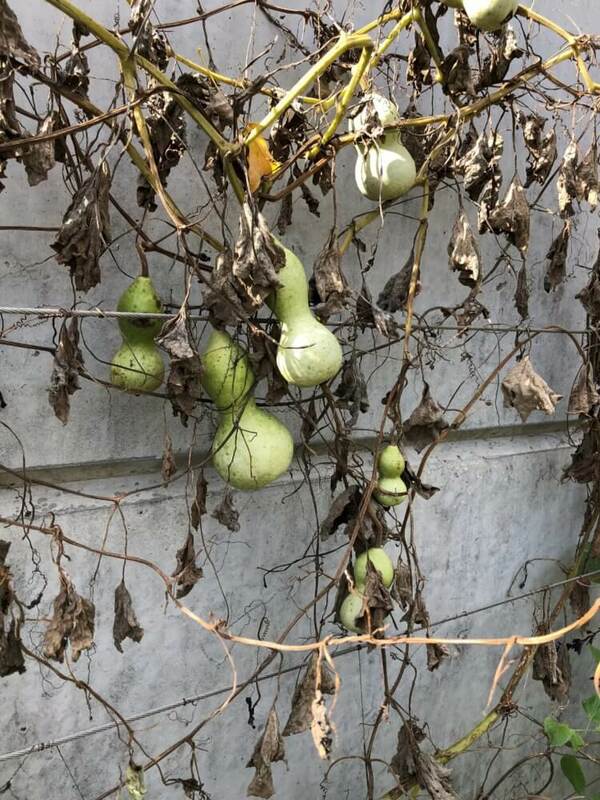 Photo by Leslie Hunter, Oct. 24, 2018. 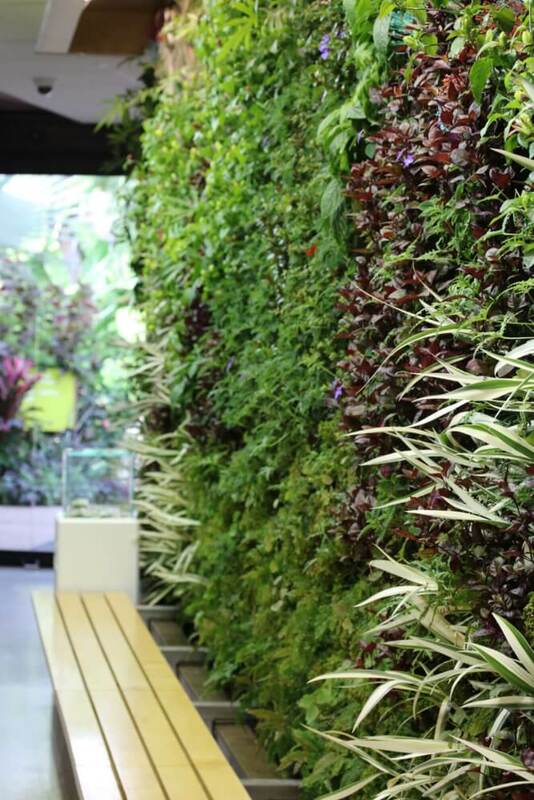 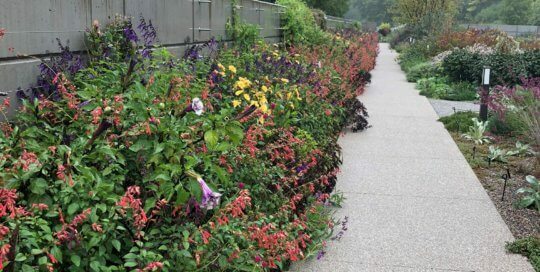 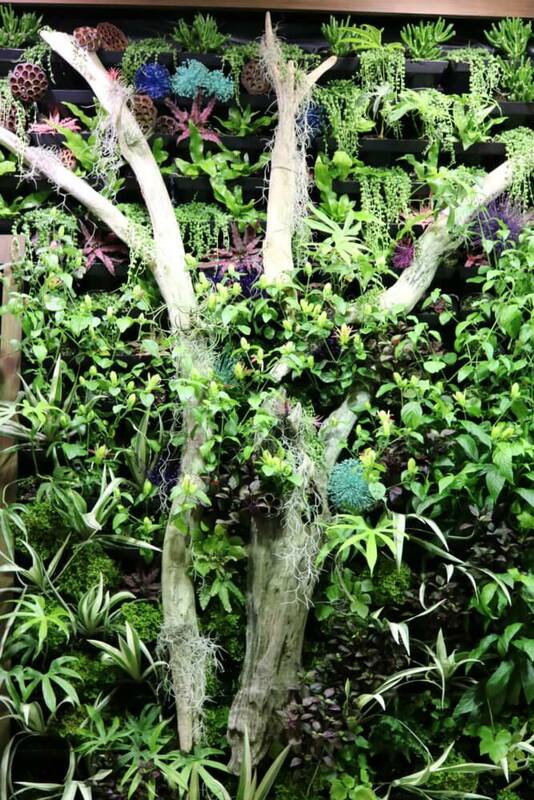 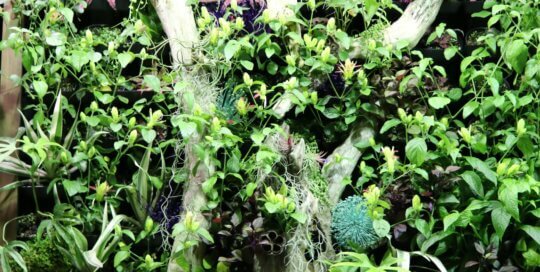 Prairie Meadows Living Wall has a new plant display. 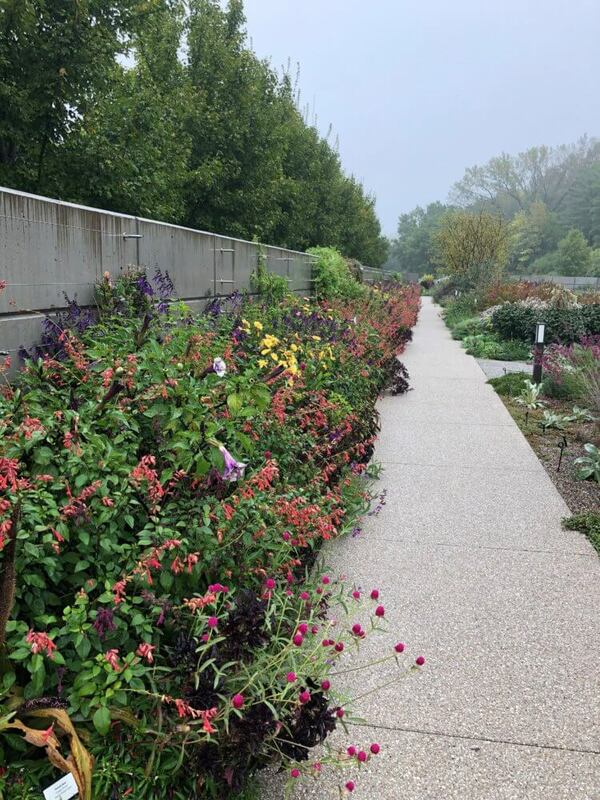 Photo by Leslie Hunter Oct. 15, 2018. 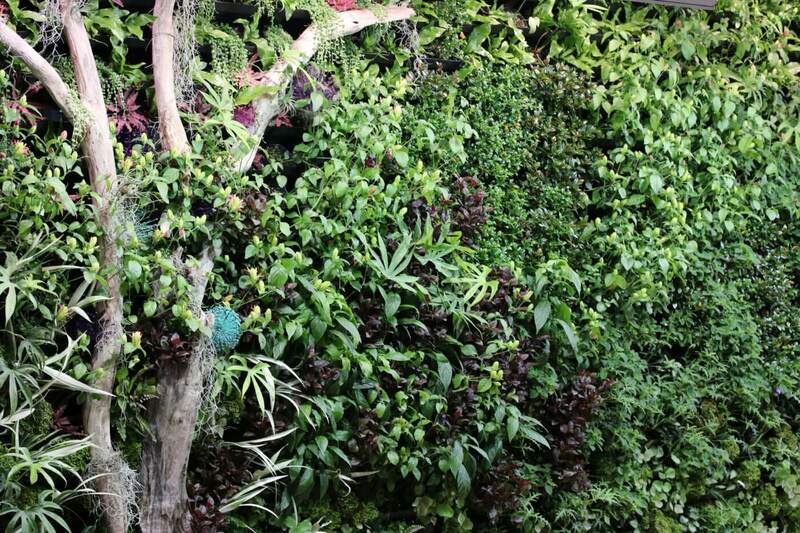 The Living Wall plants were all changed out on Oct. 2 with a fresh new design. 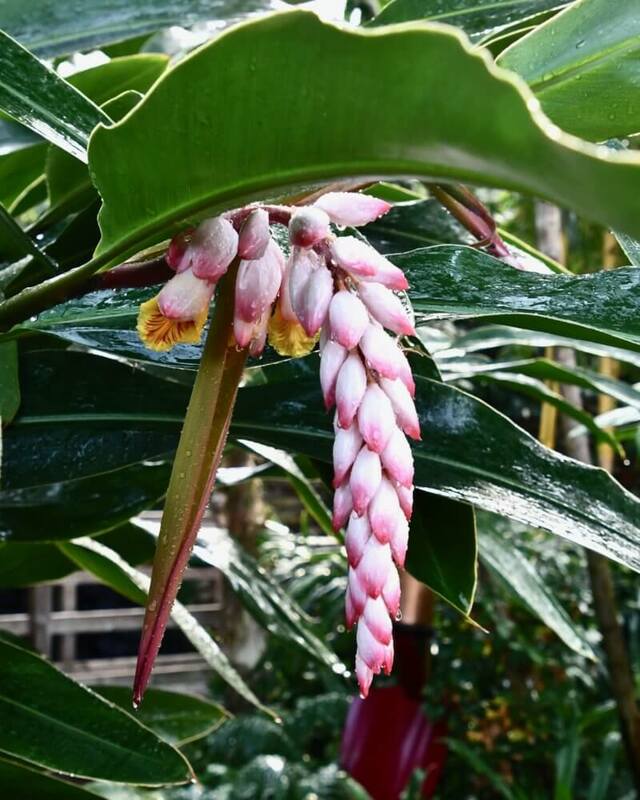 Photo by Hannah Loy. 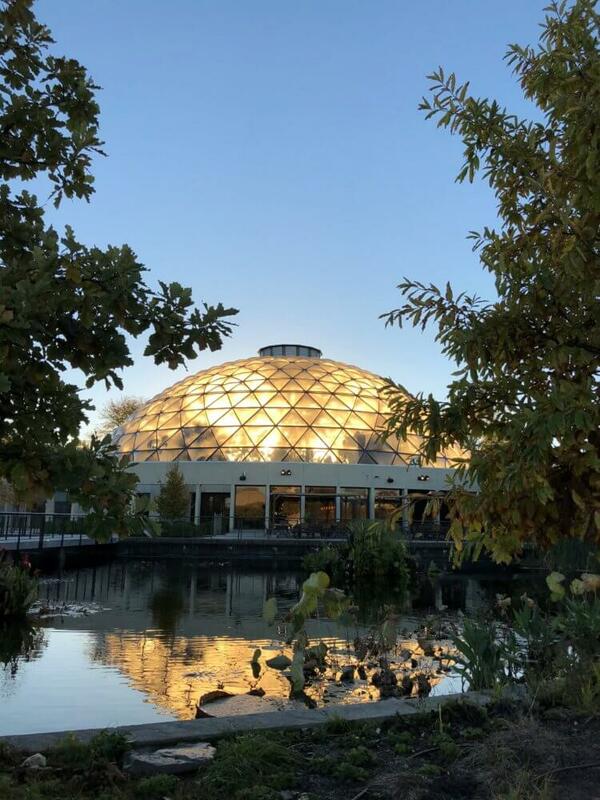 Sunrise behind the conservatory dome makes a beautiful early morning entrance. 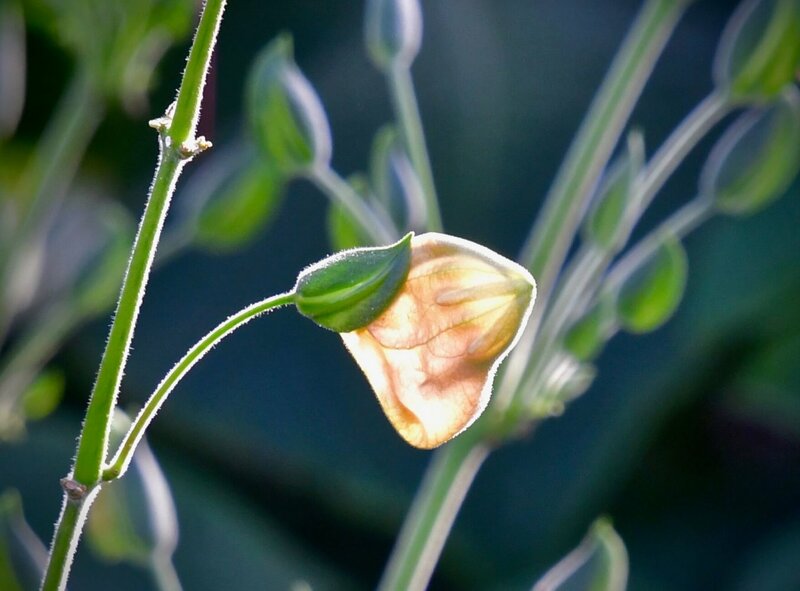 Photo by Leslie Hunter, Oct. 17, 2018. 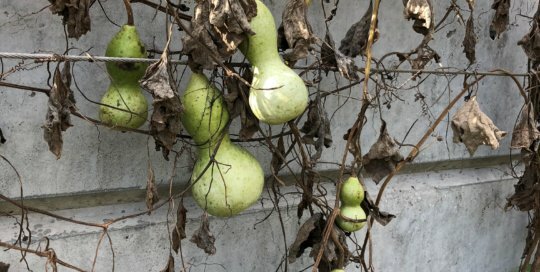 Gourds on the espalier wall. 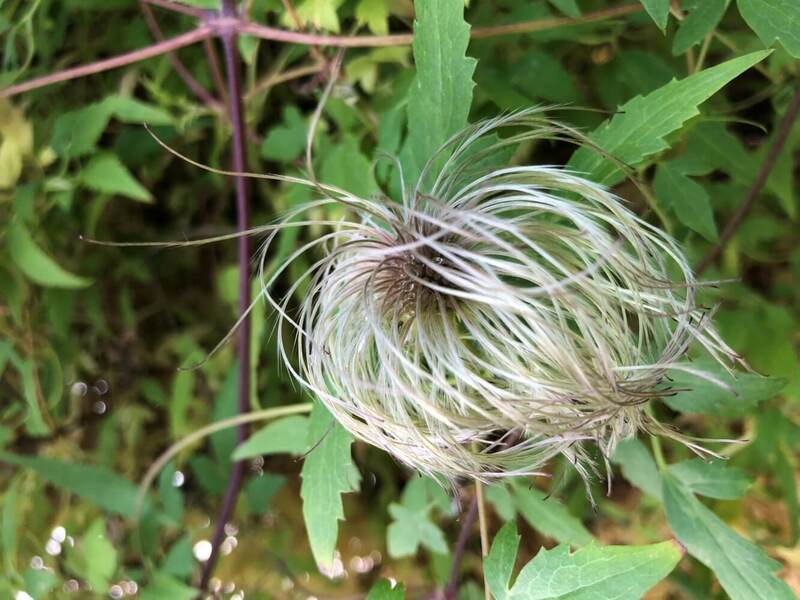 Photo by Leslie Hunter, Oct. 11, 2018.